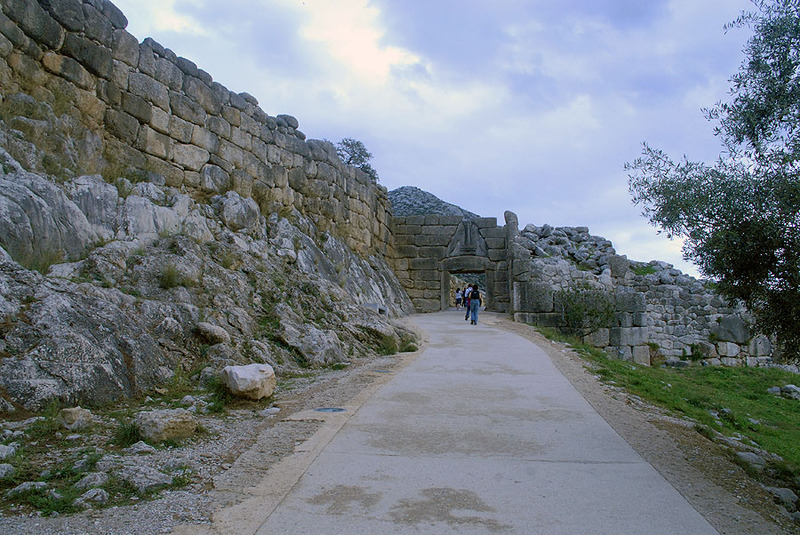 Approaching the acropolis of Mycenae. 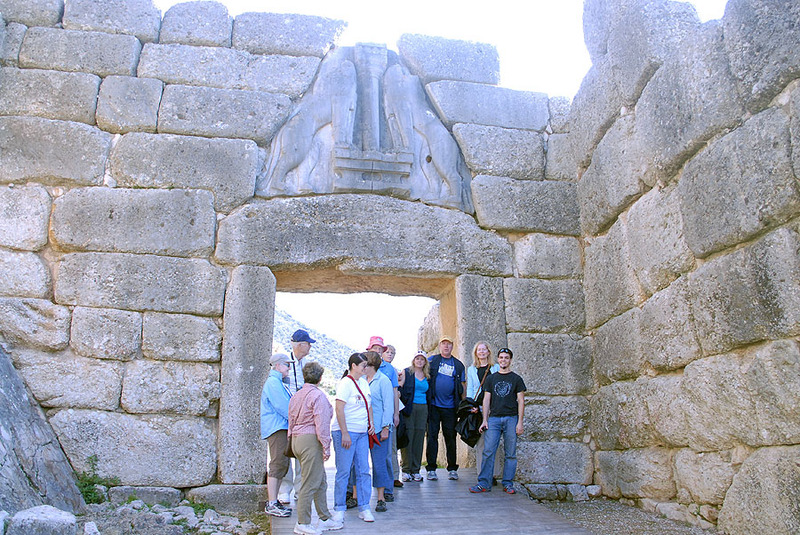 STLCC study group at the Lion Gate of Mycenae. 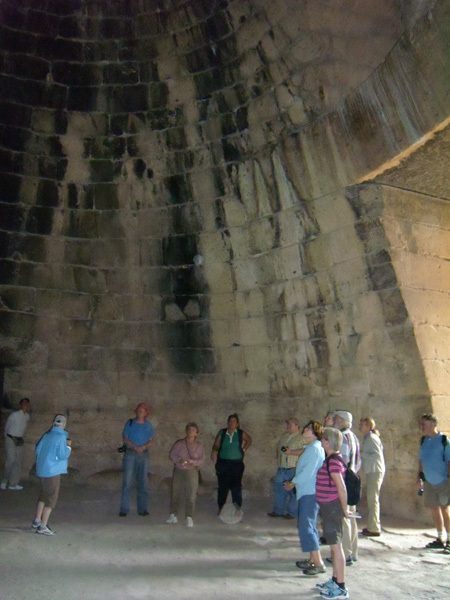 Professor Neathery Fuller (pink hat) and Professor Michael Fuller (yellow hat) led the study tour in 2009. 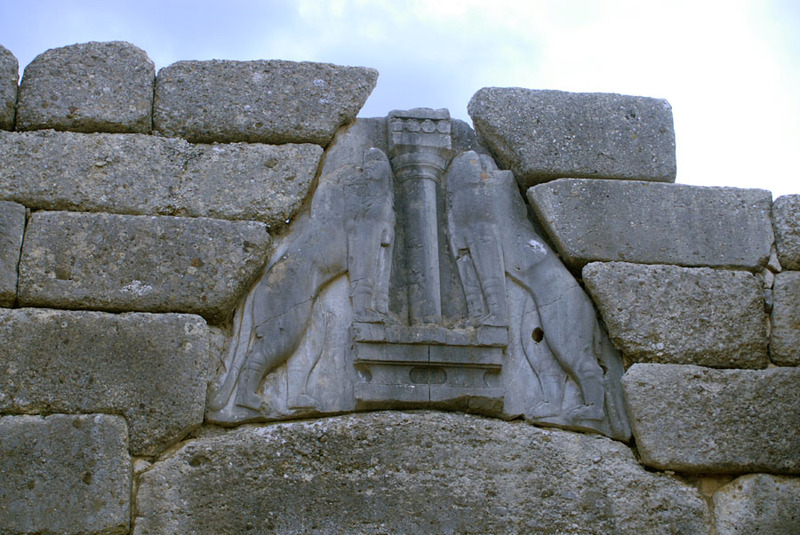 Closeup of the Lion Gate, ca. 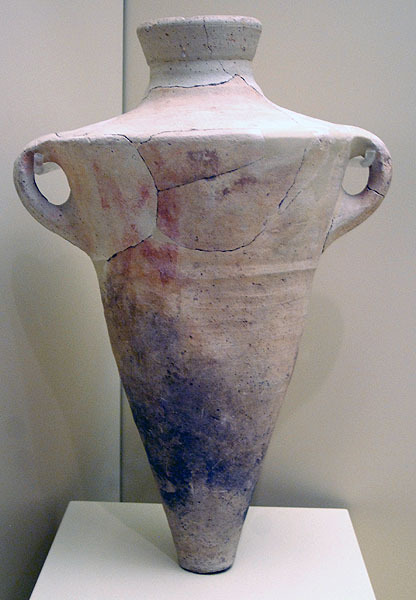 1350 BC. Older than the Lion Gate are the two royal cemeteries (Grave Circles A and B), ca. 1675 to 1600 BC. Grave Circle A reconstruction by Professor Wace. 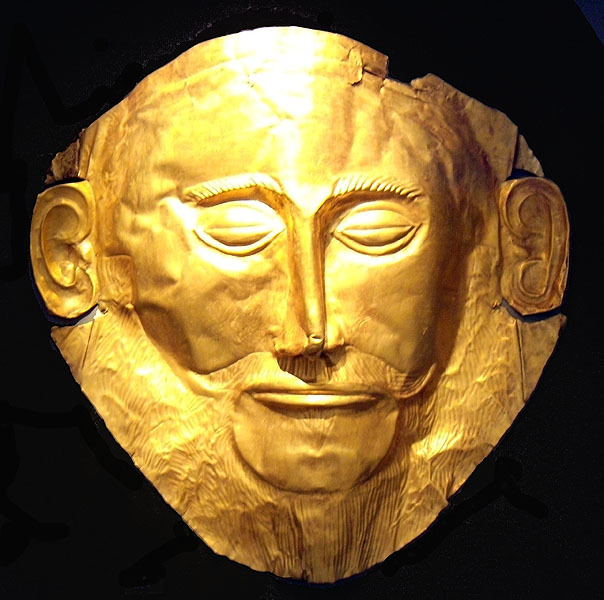 Gold funerary mask that Schliemann believed to be that of Agamemnon, but it predates that time. 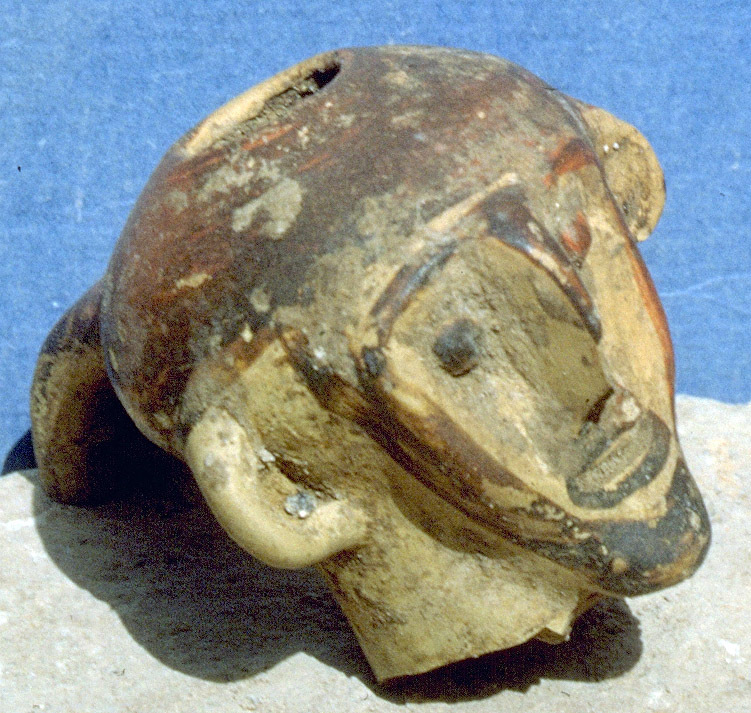 Excavated in Grave 5 of Grace Circle A. Late Helladic I royal cemetery, ca. 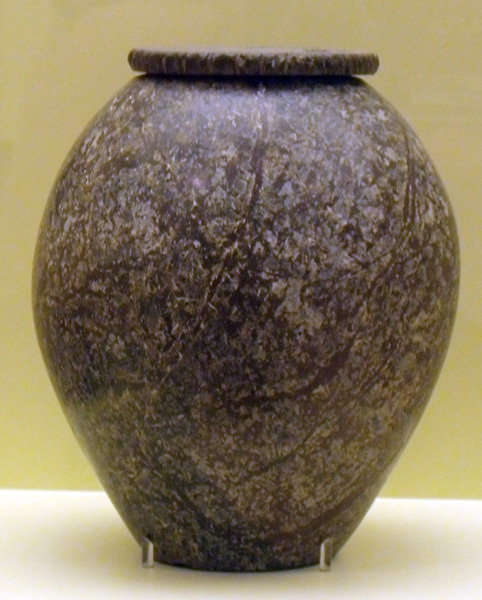 1600 BC. 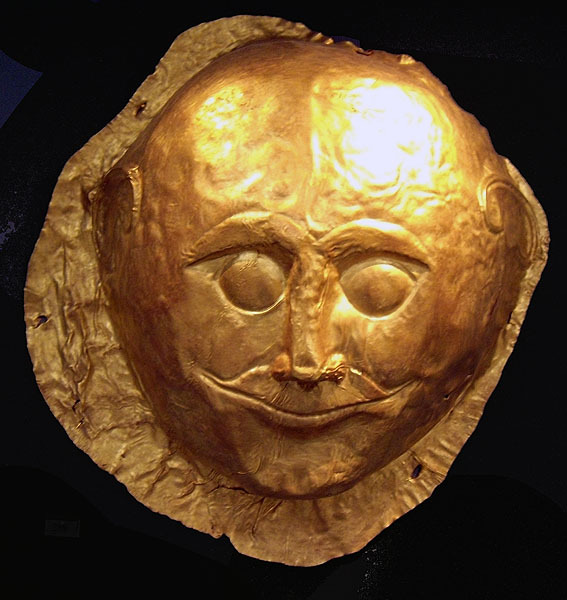 Gold Mask from Grave 4 in Grave Circle A at Mycenae. 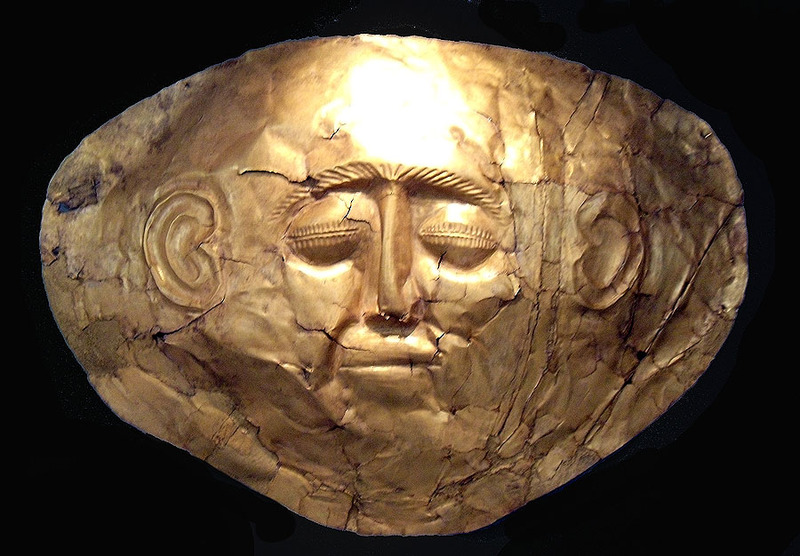 Gold mask from Grave 5 in Grave Circle A at Mycenae. 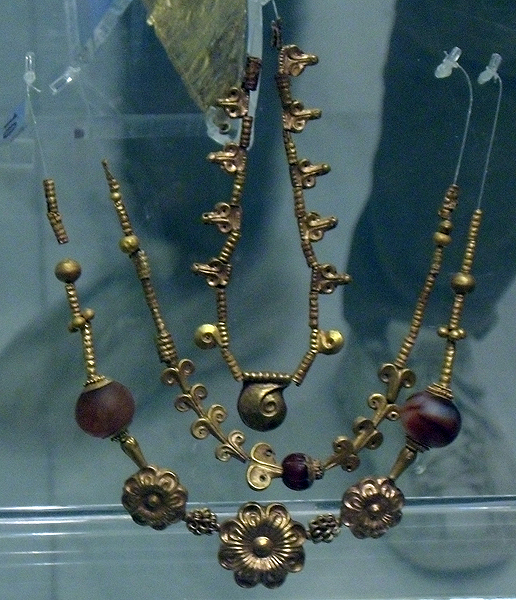 Gold diadem from Grave 3 in Grave Circle A at Mycenae. 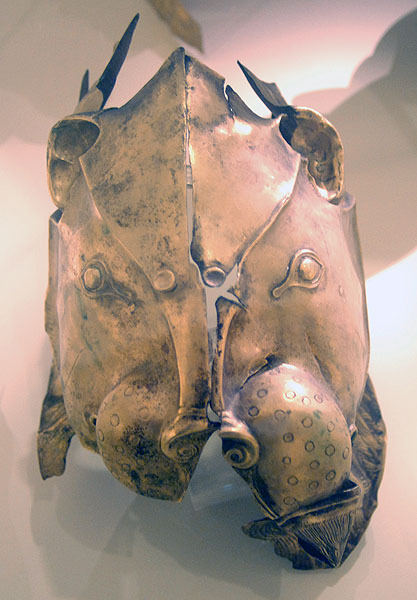 Gold lion mask from Grave 4 in Grace Circle A at Mycenae. 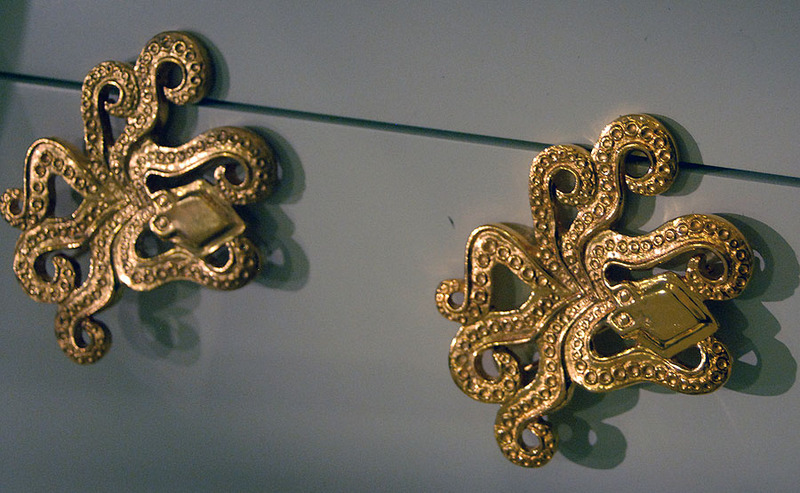 Gold brooches in the form of two octapuses from Mycenae. 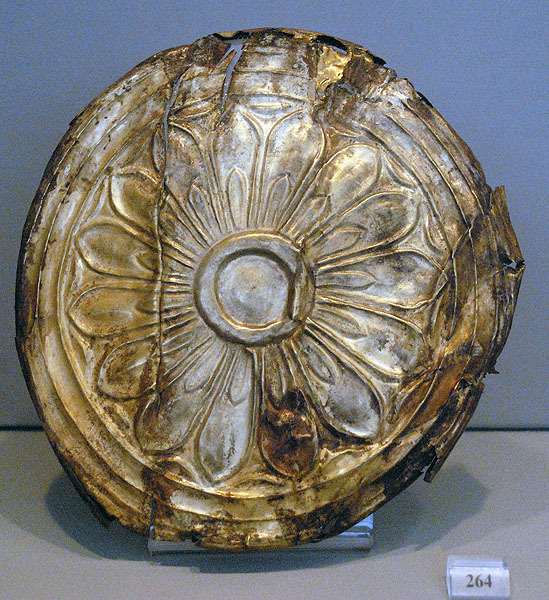 Detailed goldwork grave 4 in Grave Circle A at Mycenae. Repousse plaques used as facing on a hexagonal wooden casket. 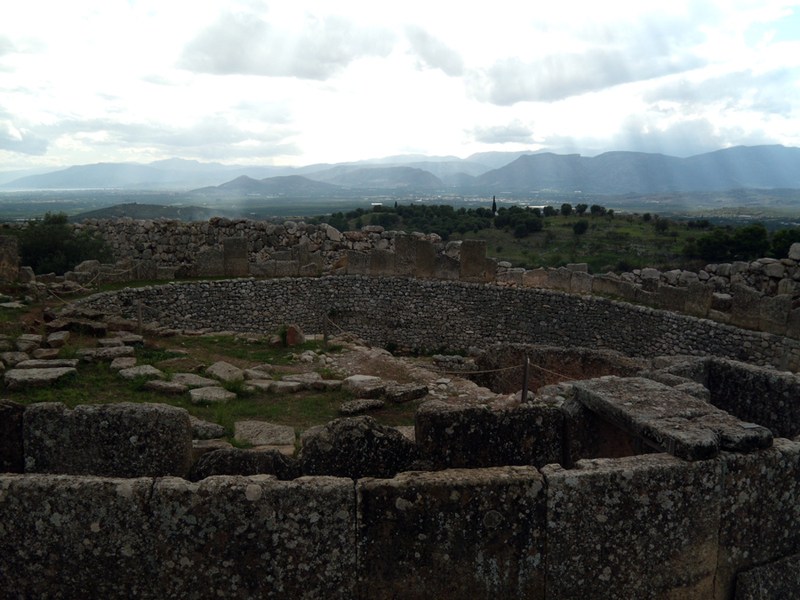 From shave grave 5 of Grave Circle A at Mycenae. 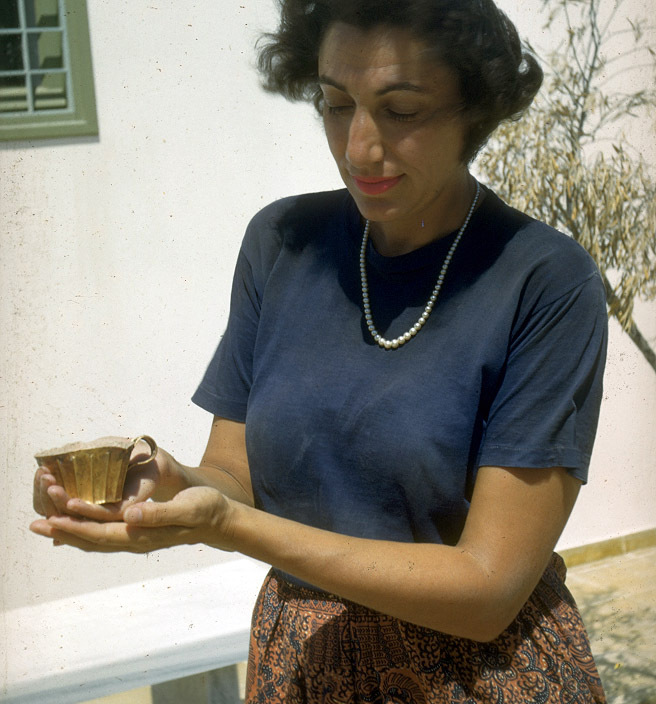 Dr. Betty Grossman (St. Art Museum) holding a gold wine cup excavated from Mycenae by the team of archaeologists working under Professor George Mylonas (WU). Photograph taken in the 1950s. 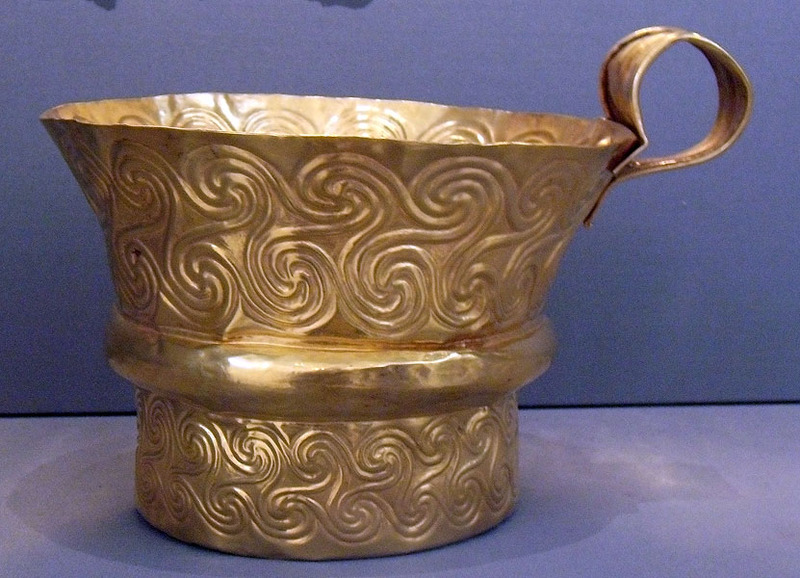 Gold cup decorated with spirals executed in repousee from Grave 5 of Grave Circle A at Mycenae. Height 5 inches. 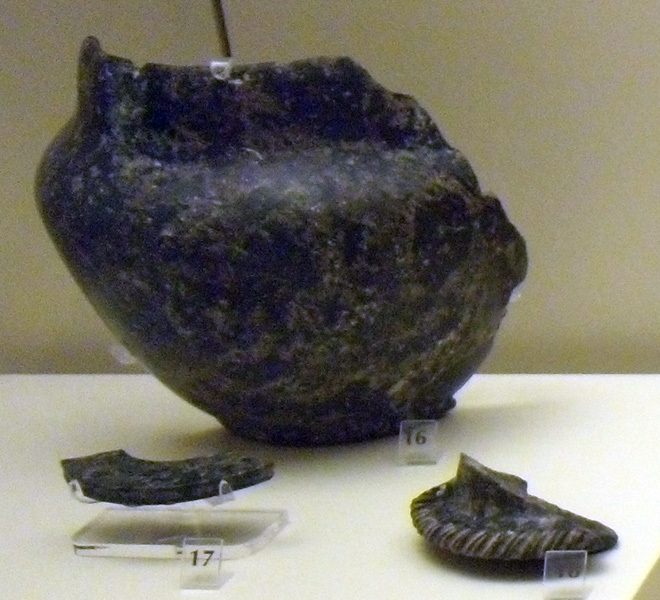 Two handled, gold cup from Grave 4 of Grave Circle A at Mycenae. 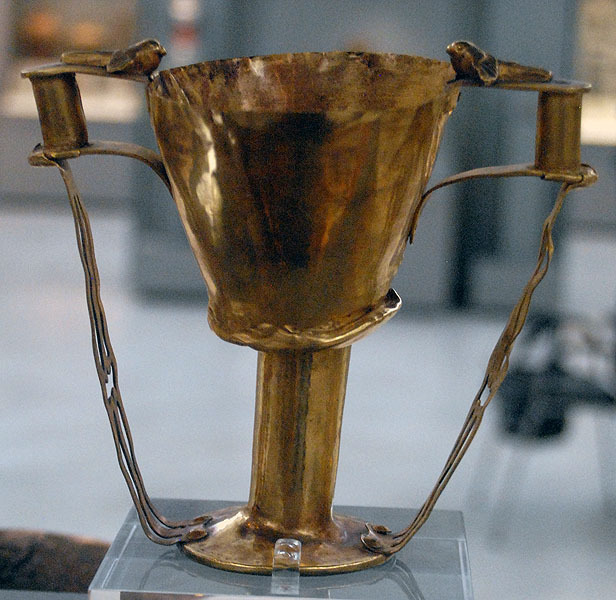 Falcon's rest on each handle; Schliemann had dubbed this artifact "Nestor's cup" in an attempt to link the artifact with the Illiad. 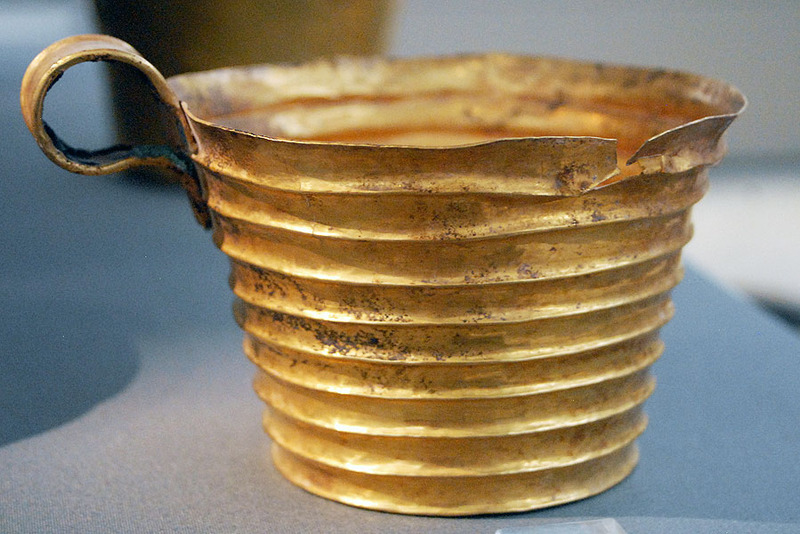 Gold cup with horizontal ribs from Grave Circle A at Mycenae; museum inventory number 392. 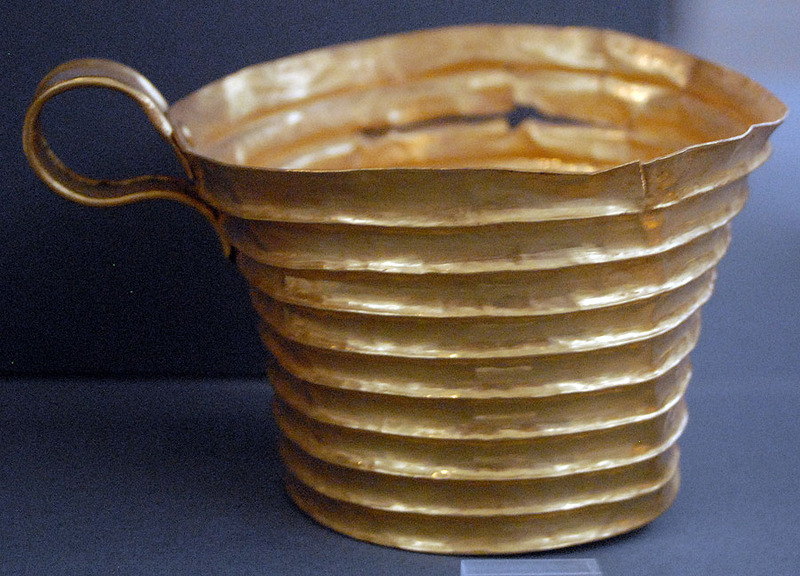 Gold cup with horizontal ribs from Grave Circle A at Mycenae; museum inventory number 393. 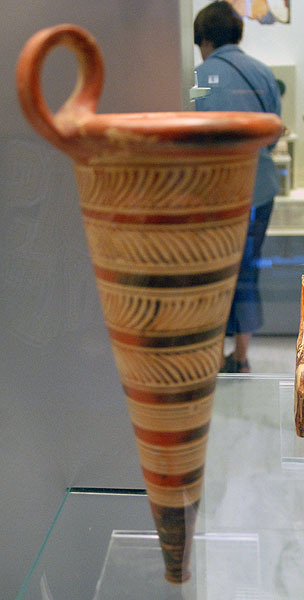 Bronze dagger with inlaid gold and niello decoration found in Grave Circle A at Mycenae. 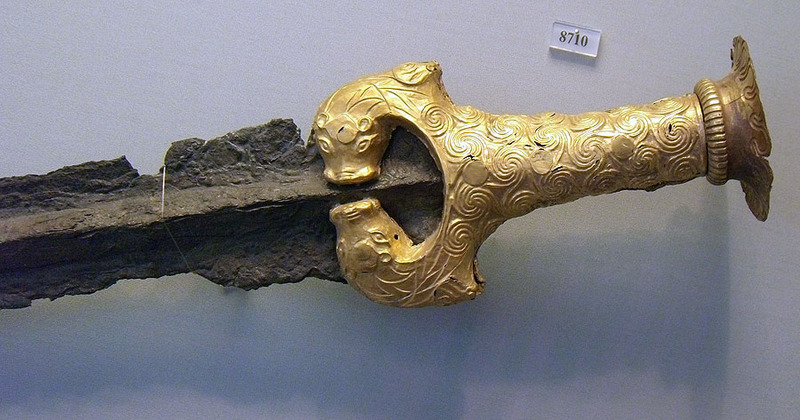 Bronze dagger with inlaid of gold and silver from grave 4 in Grave Circle A at Mycenae. The scene shows warriors and a bowman dancing on a group of lions. Bronze dagger with inlay of gold, silver and niello. 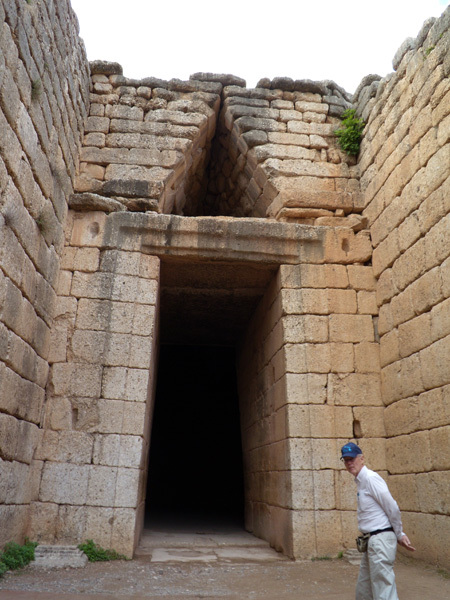 Found in Grave Circle A at Mycenae. Bronze dagger with inlay of gold, silver and niello. 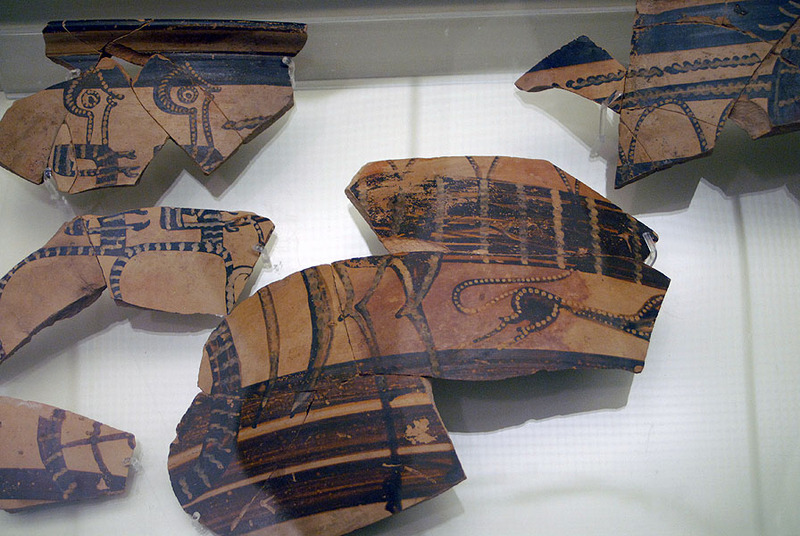 Found in Grave 5 in Grave Circle A at Mycenae. Bronze sword with gold hilt from grave Delta in Grave Circle B at Mycenae. 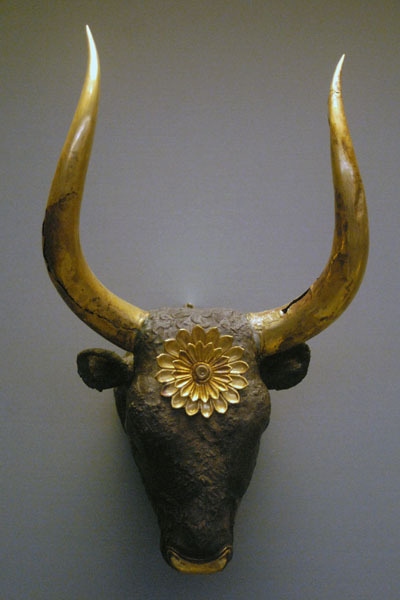 Silver and gold rhyton in the shape of a bull's head from Grave 4 in Grave Circle A at Mycenae. 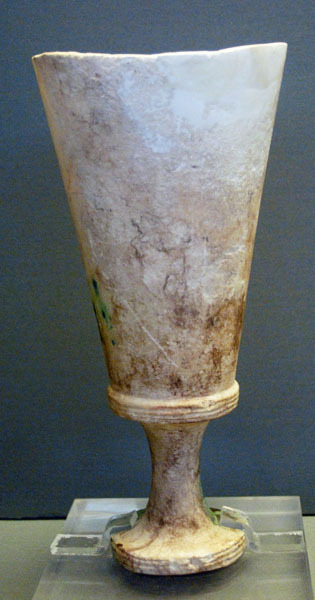 Alabaster chalice from Grave 5 in Grave Circle A at Mycenae. 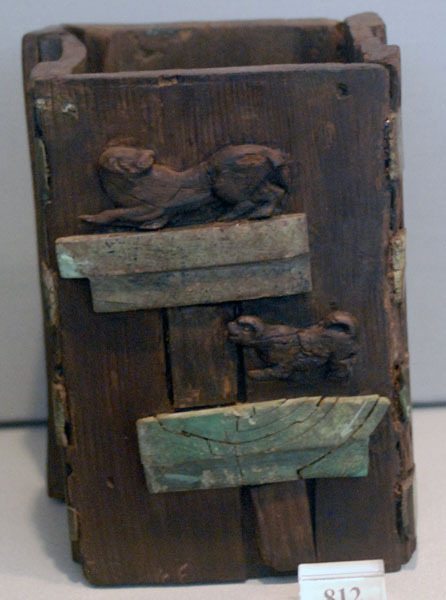 Wooden pyxis with appliqué ivory dogs from Grave 5 in Grave Circle A at Mycenae. 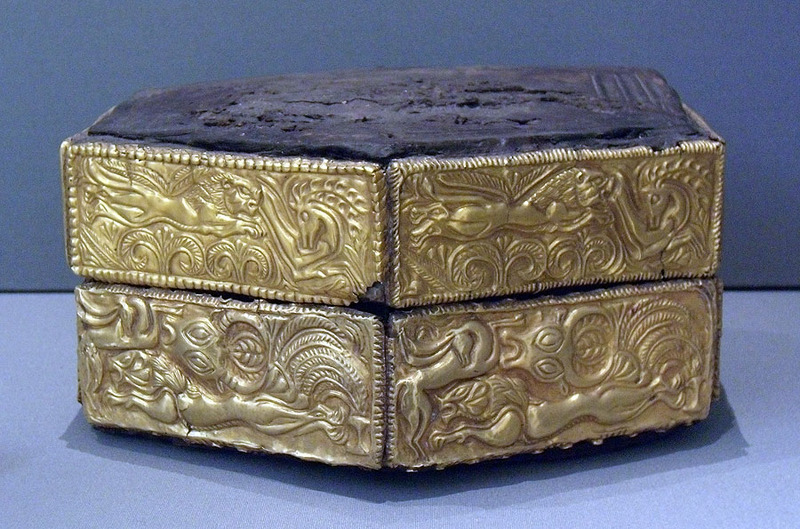 Thin gold sheet that would have originally covered the lid to a (wooden?) 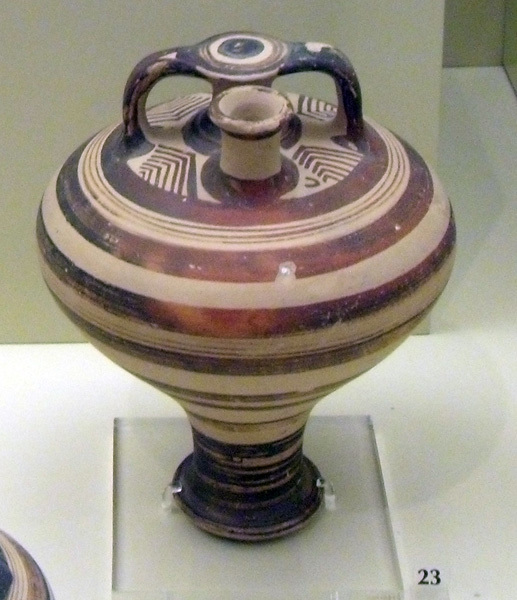 pyxis from Grave 4 in Grave Circle A at Mycenae. 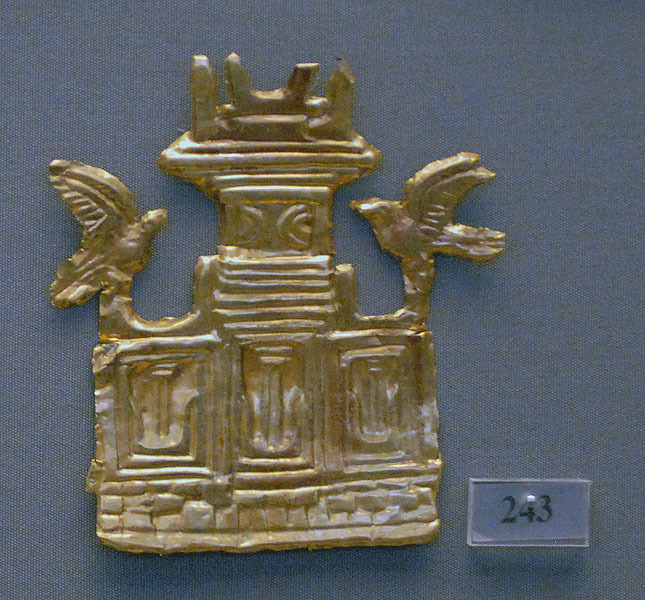 Gold leaf ornament of a temple from Grave 3 in Grave Circle A at Mycenae. 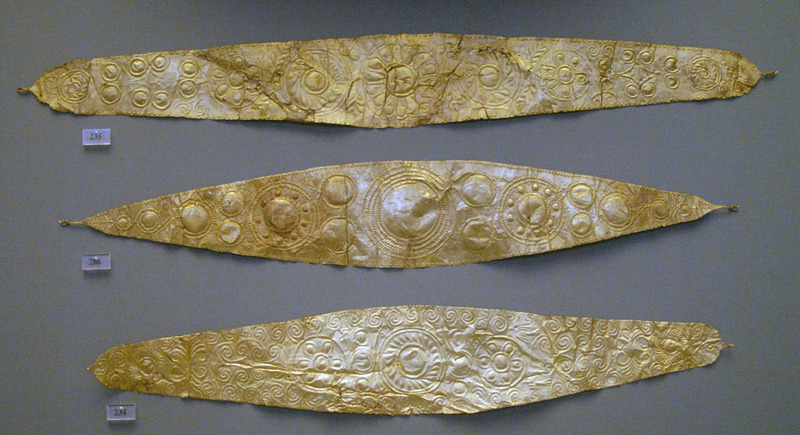 Three gold diadems from Grave Circle A at Mycenae. 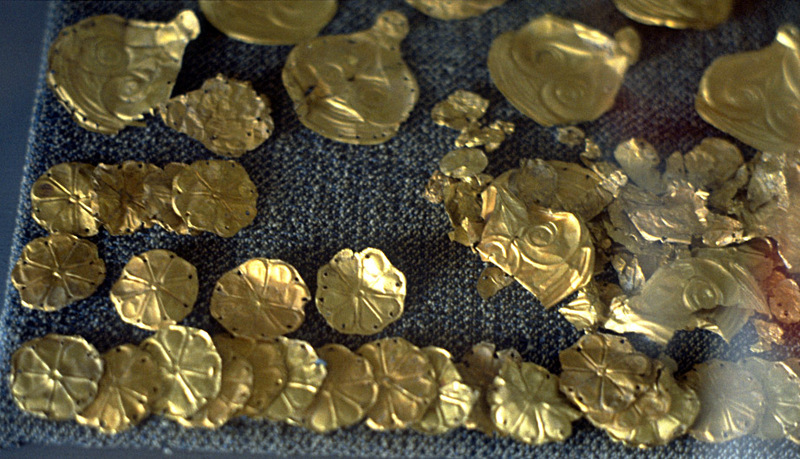 Two gold diadems from Grave Circle A at Mycenae. 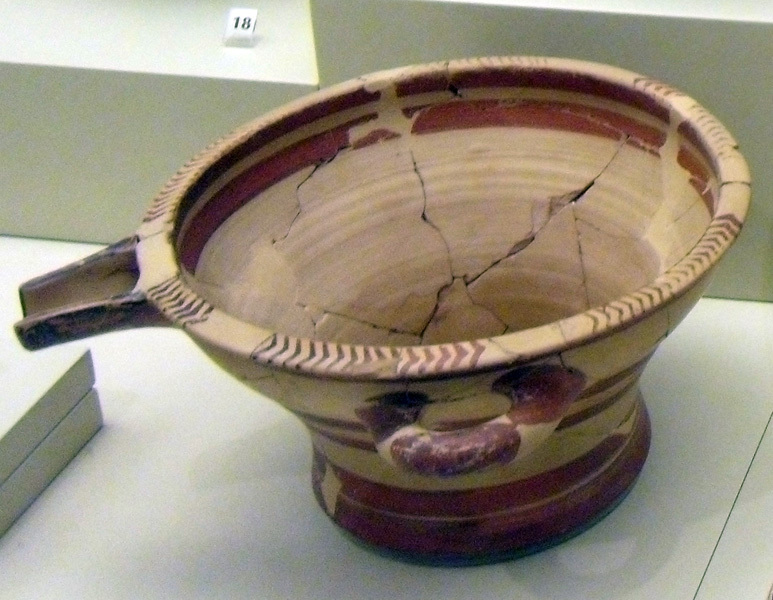 Gold Cup from Grave Nu (N) in Grave Circle B at Mycenae. 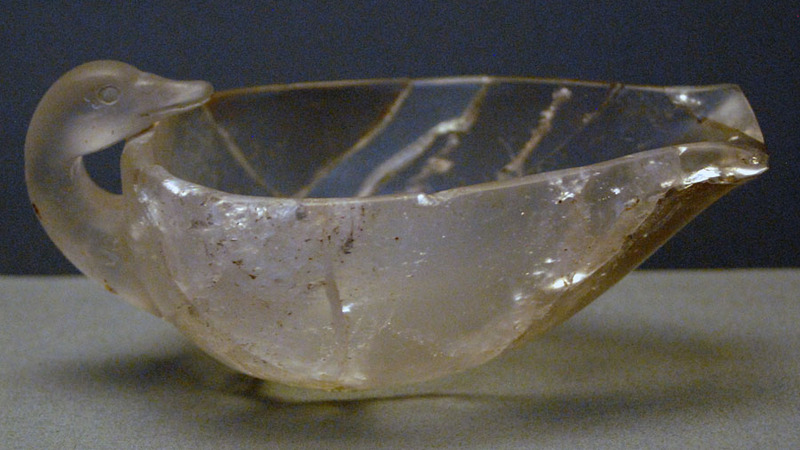 Crystal bowl in the shape of a duck from Grave Omikron (O) in Grave Circle B at Mycenae. 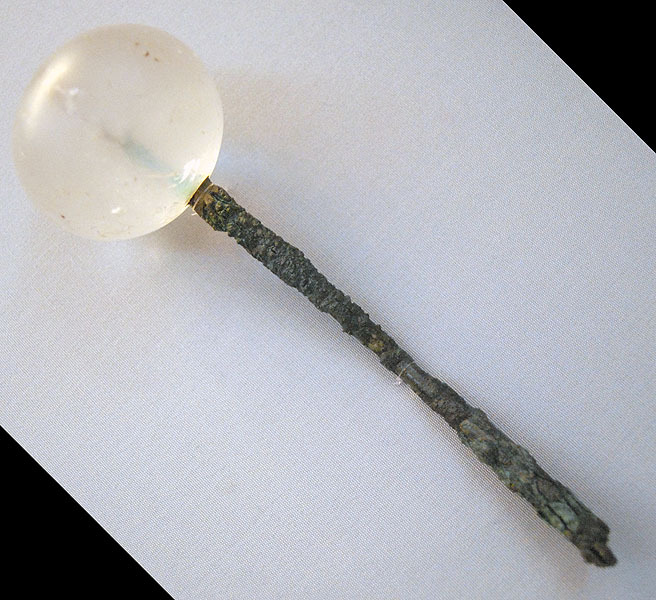 Bronze pin with a head of rock crystal from Grave Omikron (O) in Grave Circle B at Mycenae. 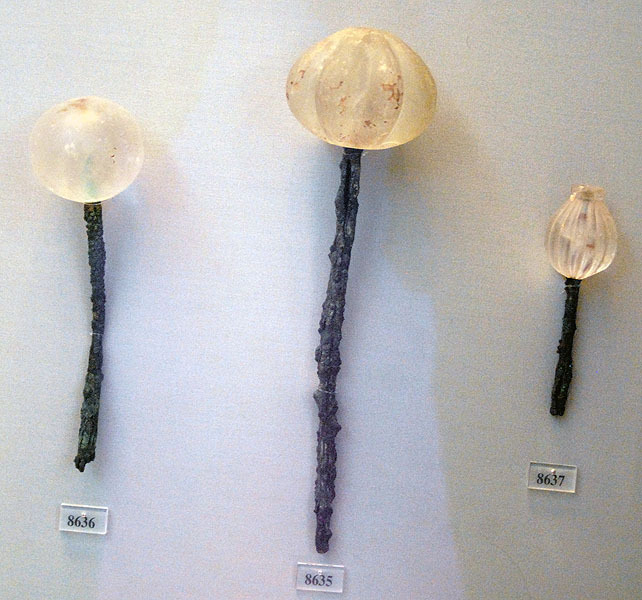 Three bronze pins with rock crystal heads from Grave Circle B at Mycenae. 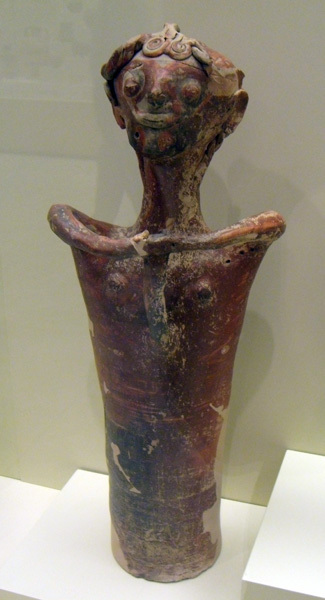 Cultic effigy vessel manufactured from pottery, Mycenae. 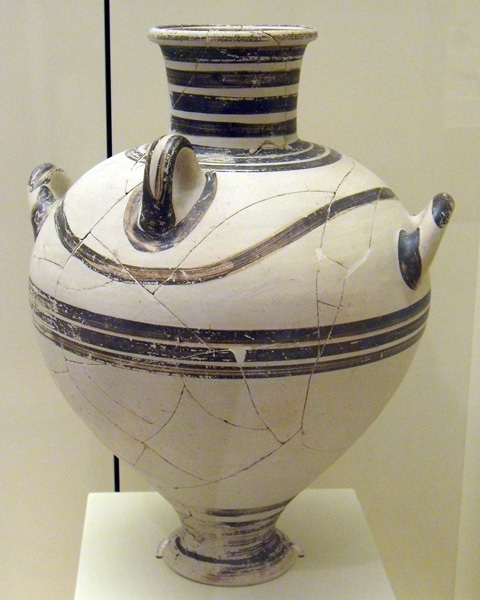 Anthropomorphic pottery vessel from the alcove of "Temple Room" 18 at Mycenae. 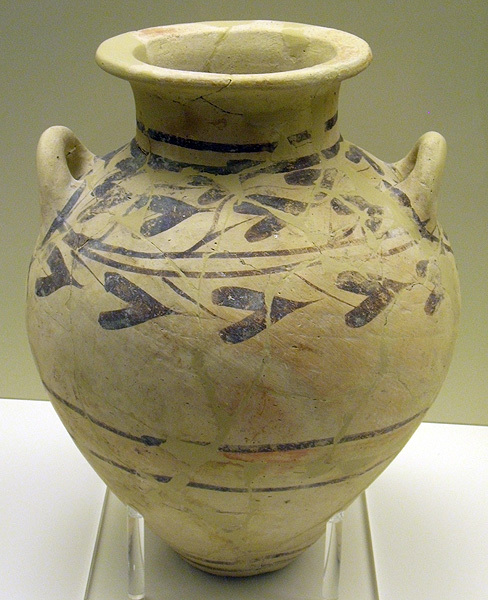 Dated 1250 - 1180 BC. 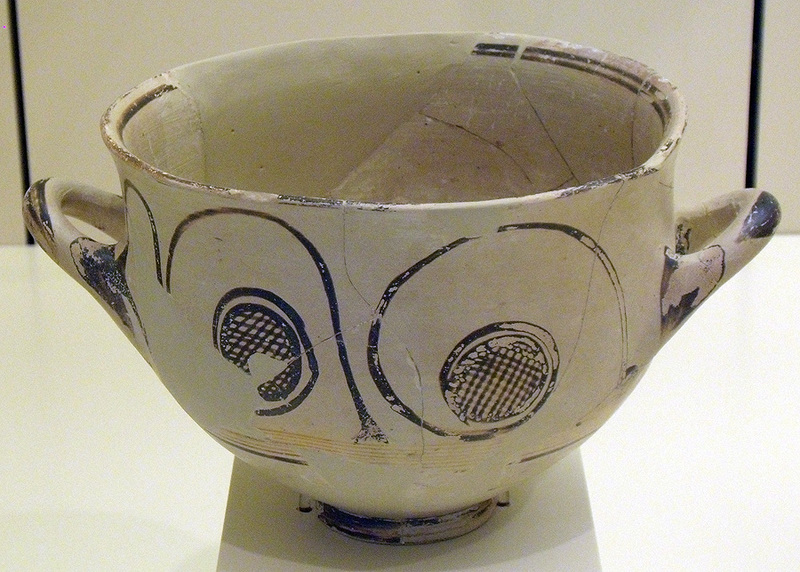 Anthropomorphic pottery vessel from the Cult Center area at Mycenae. 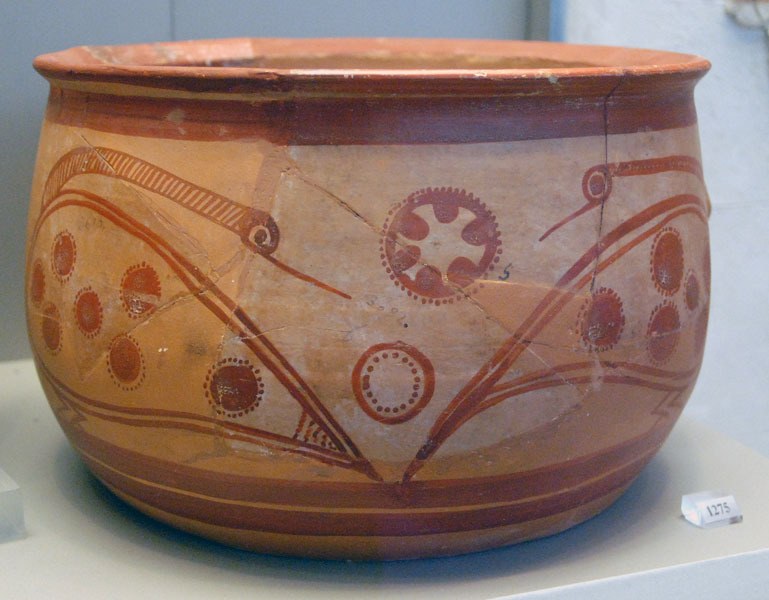 Dated 1350 - 1300 BC. 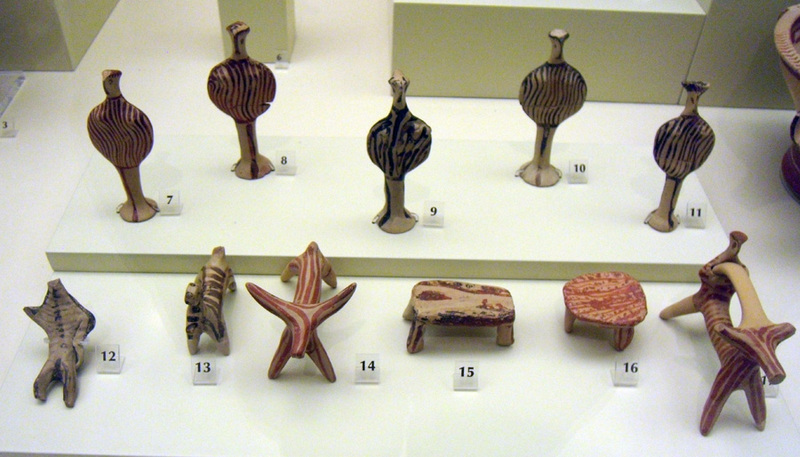 Hand-sized painted figurines from Mycenae. 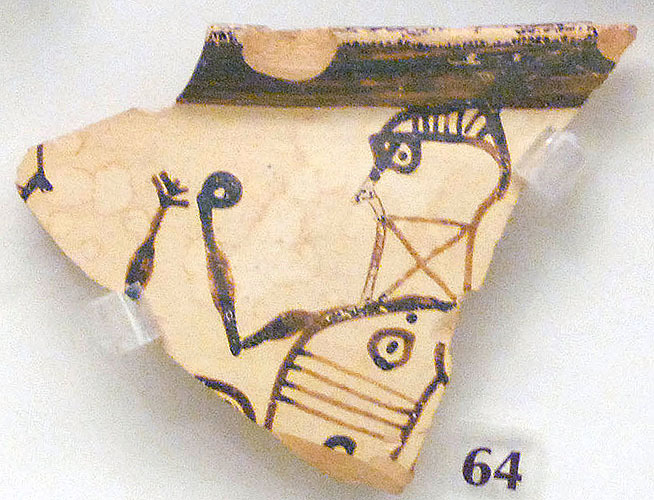 Pictoral sherd of a boxer from the Cult Center area at Mycenae. Dated 1350 - 1180 BC. 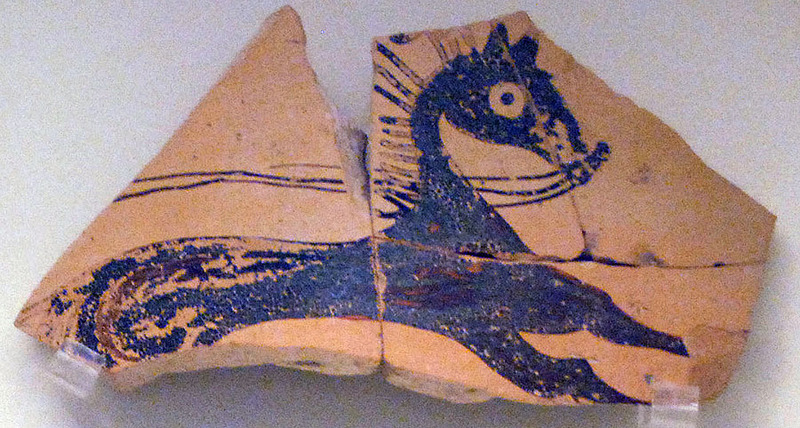 Pictoral sherd of a horse in flying gallop from the Cult Center area at Mycenae. 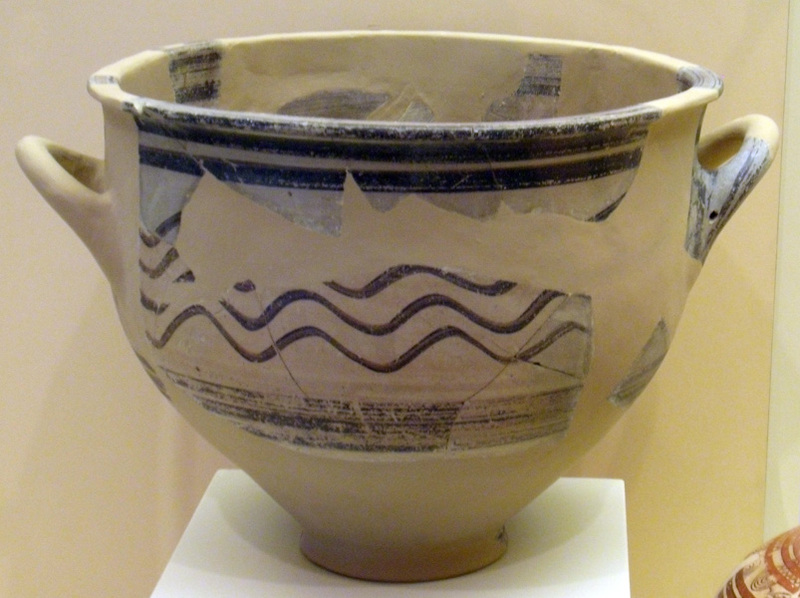 Dated 1100 - 1050 BC. 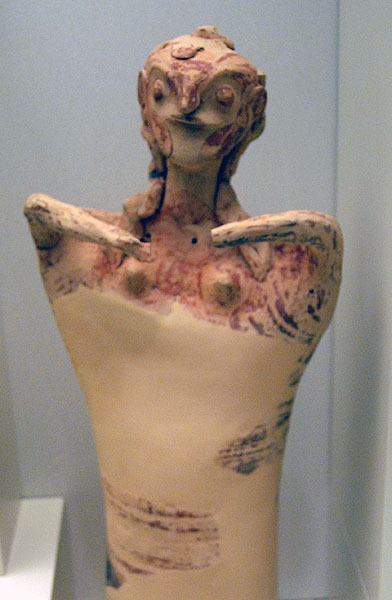 Pictoral sherd of a charioteer from the Hellenistic tower area at Mycenae. 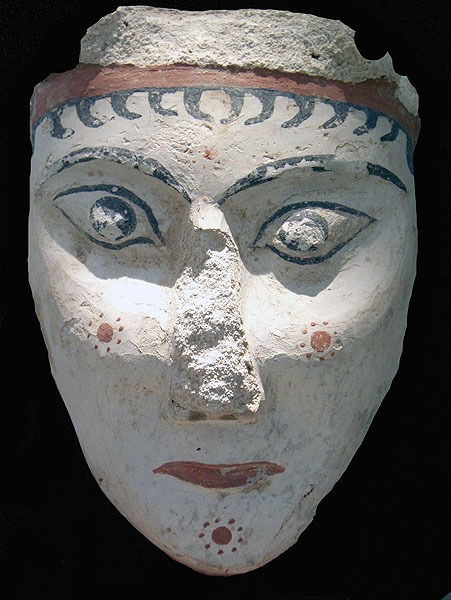 Dated 1180 - 1050 BC. 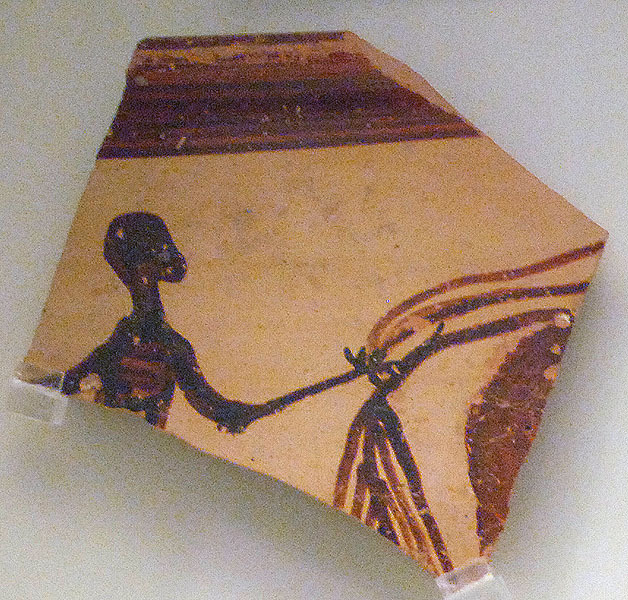 Pictoral sherd of a charioteer from Mycenae. 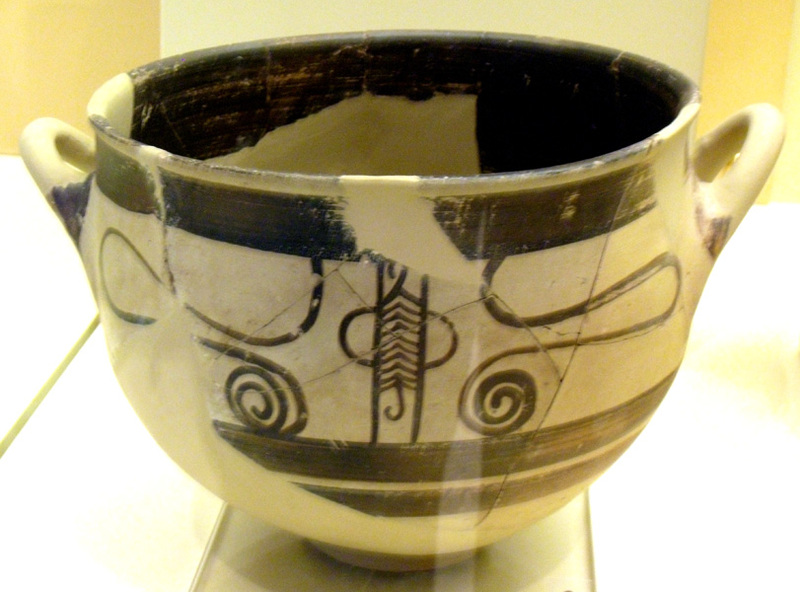 Dated 1180 - 1050 BC. 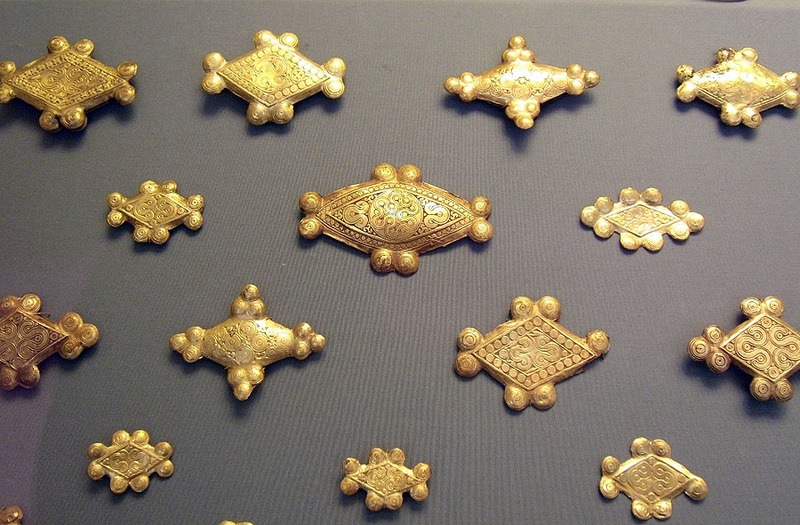 Gold ornaments with small holes - probably sewn onto royal or sascred clothing; from Mycenae. 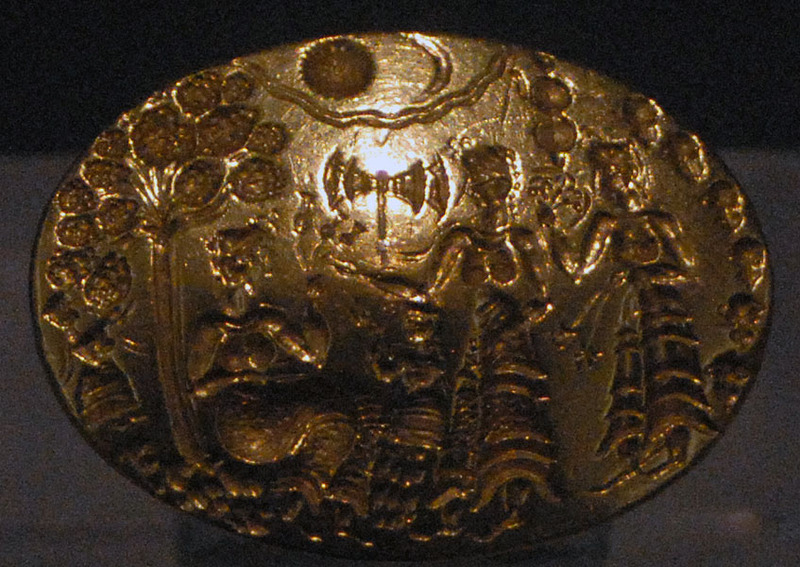 Gold seal-ring from grave 4 in Grave Circle A. The bezeal is 3.4 cm in length. 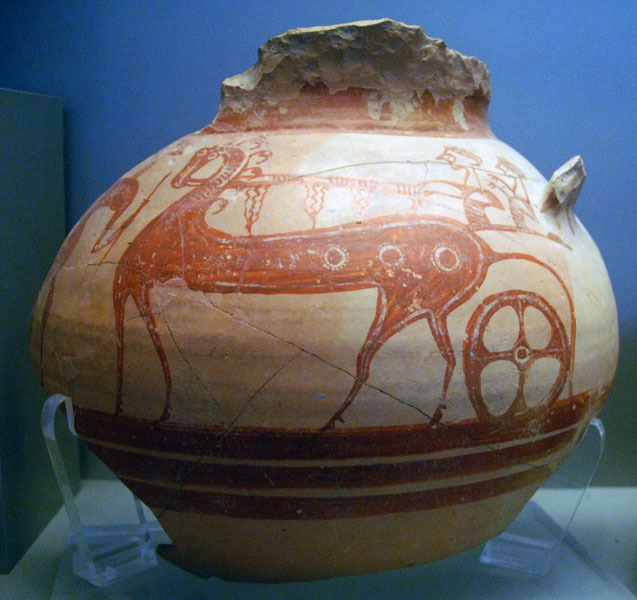 The design represents two men in a chariot hunting a stag. 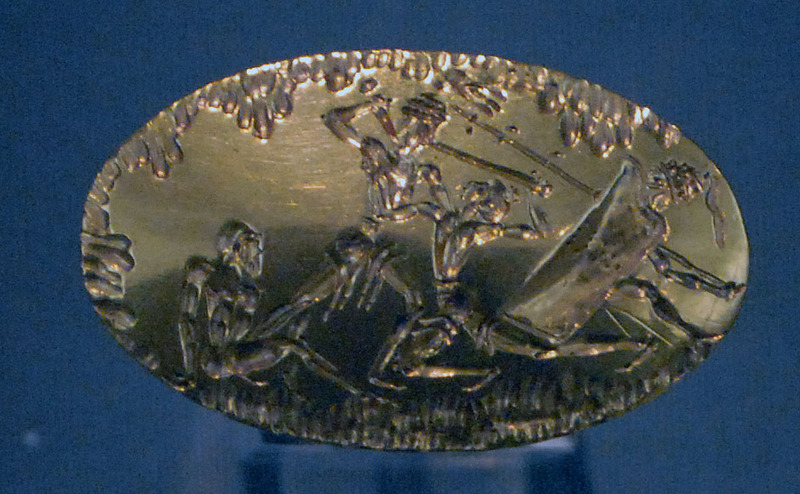 Gold seal-ring from grave 4 in Grave Circle A at mycenae. The design represents a scene of battle between a victorious warrior and three opponents. 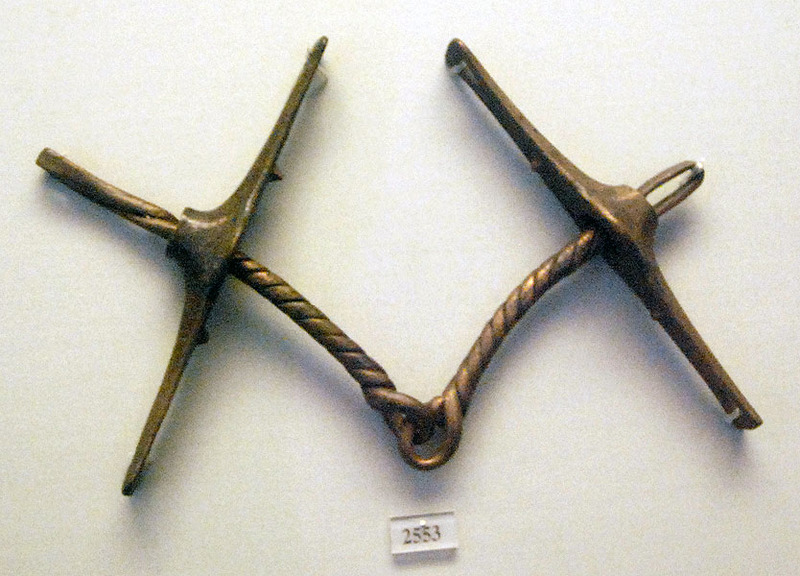 Gold seal-ring with a prominent design of a double-headed axe found outside the grave circles by Schliemann at Mycenae. 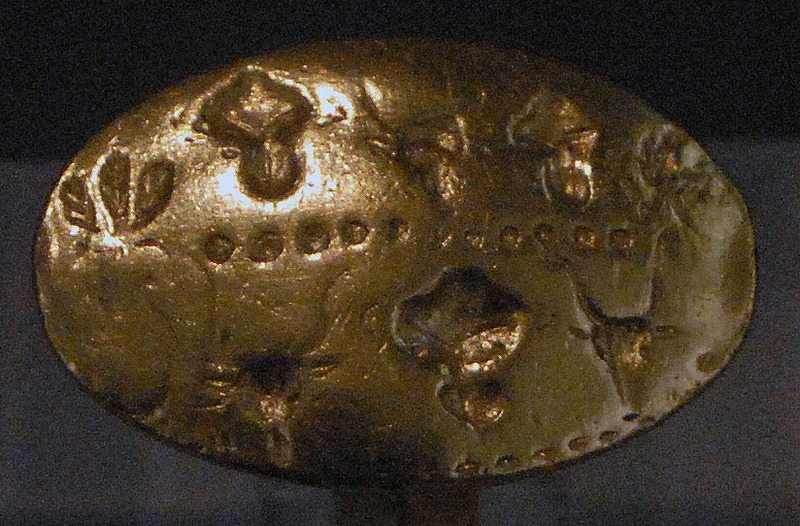 Gold seal-ring with 3 bull head decorations found outside the grave circles by Schliemann at Mycenae. 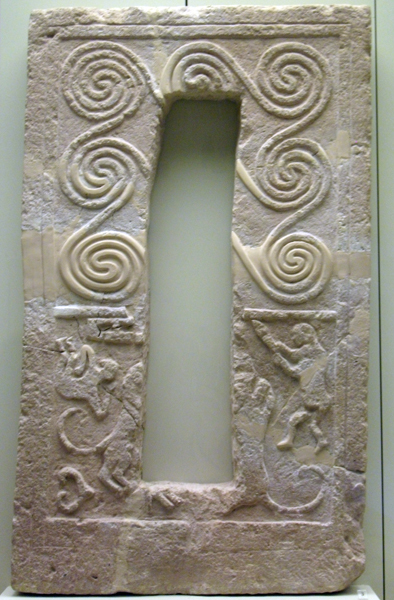 Stele from grave P in Grave Circle A at Mycenae. 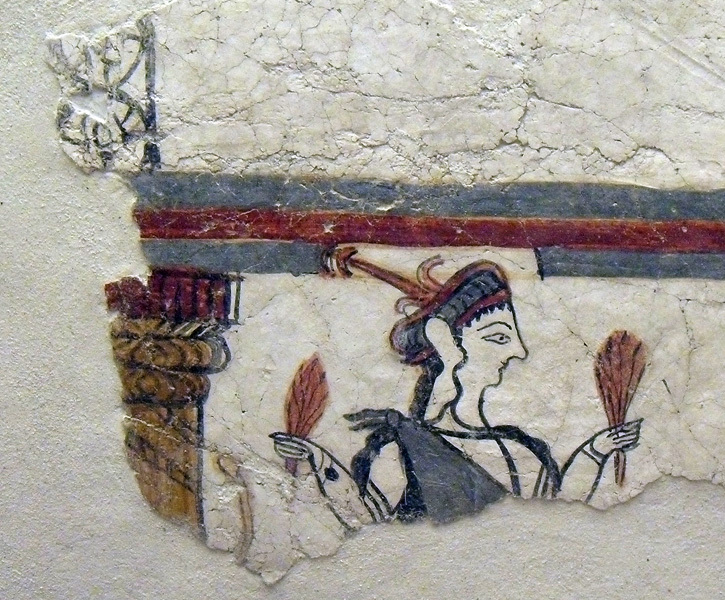 Mycenaean wall painting of a priestess or goddess holding bundles of harvested cereal harvest. 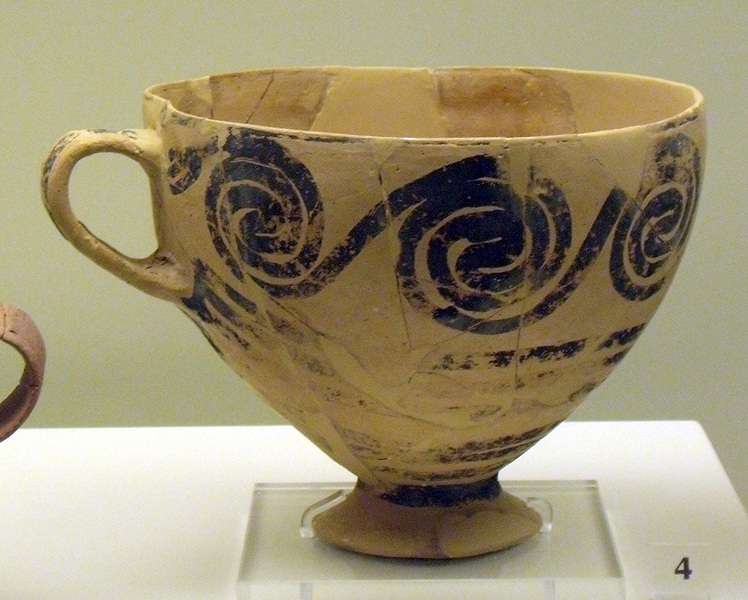 Found at the house of Frescoes near Grave Circle A at Mycenae; dated to the 13th century BC. 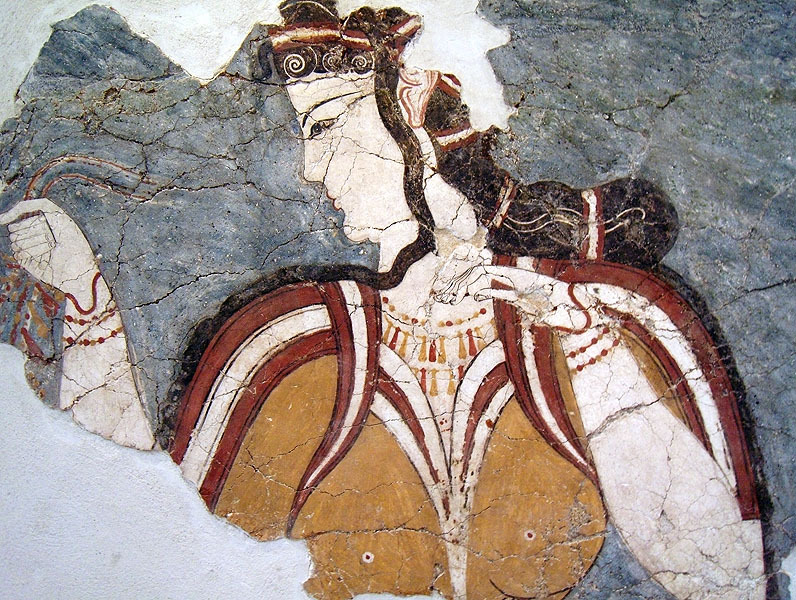 Wall painting from Mycenae that has been described as the "Lady of Mycenae" or the "Goddess with Necklace." This comes from a larger scene from the "High Priest's House." 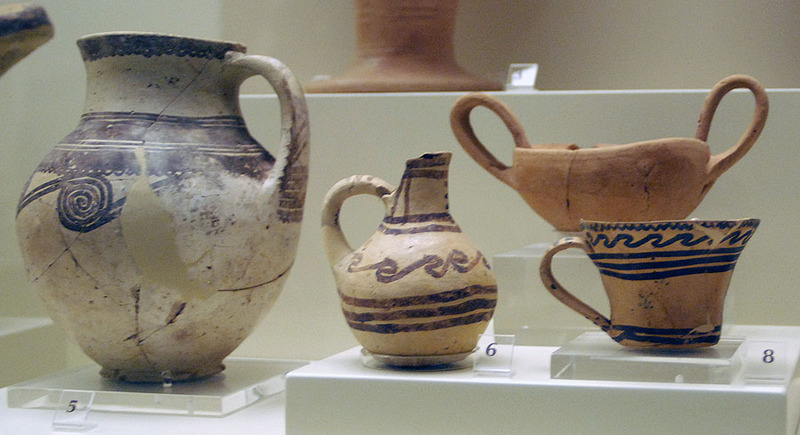 National Archaeological Museum no 11670. Painted stucco (on limestone?) 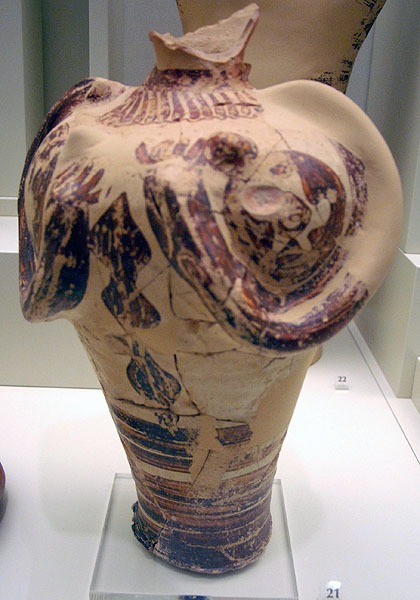 head of a woman/goddess (sometimes called "head of a Sphinx")from Mycenae. 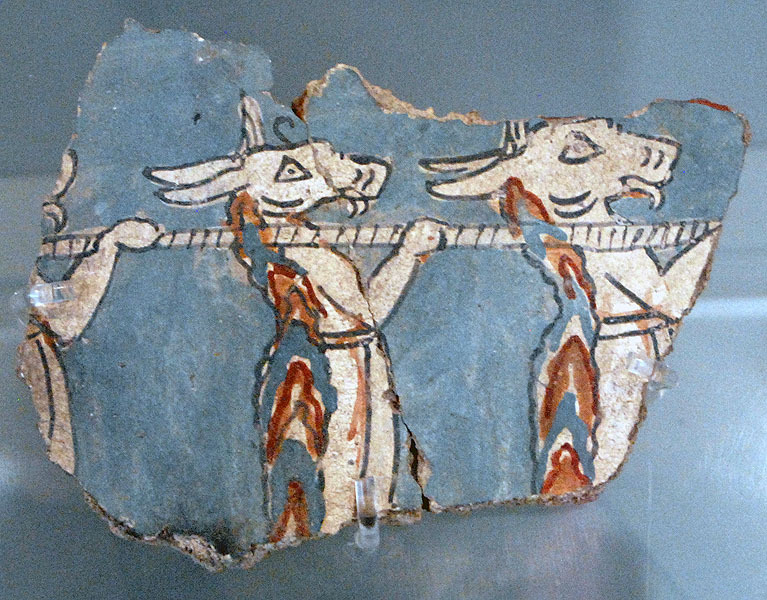 Found in a house south of Grave Circle A and considered to date from the 13th century BC. Height 16.8 cm. National Archaeological Museum no. 4575. 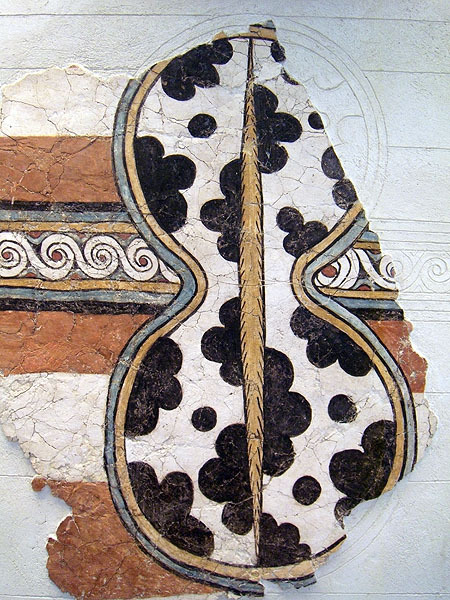 Wall painting of a figure-of-eight military shield from Mycenae. 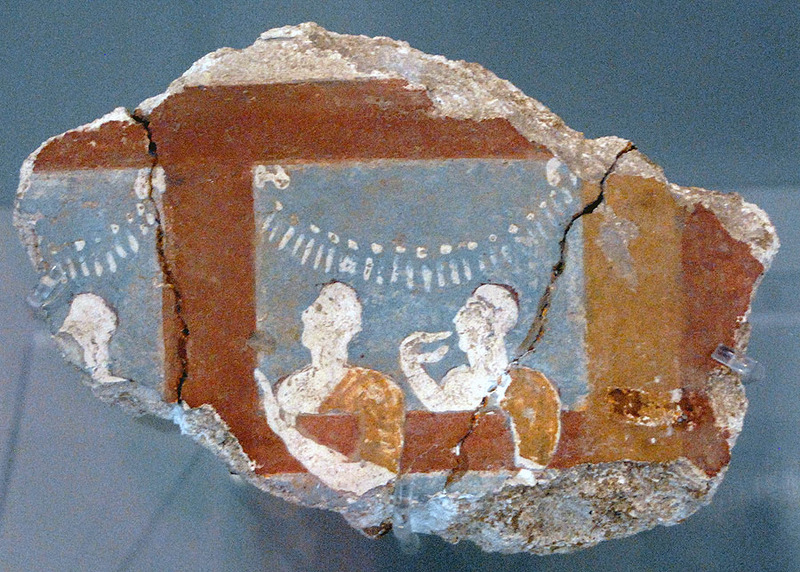 Small fragment of a wall painting probably showing a banquet in a festooned palace; from the "Ramp House" at Mycenae. 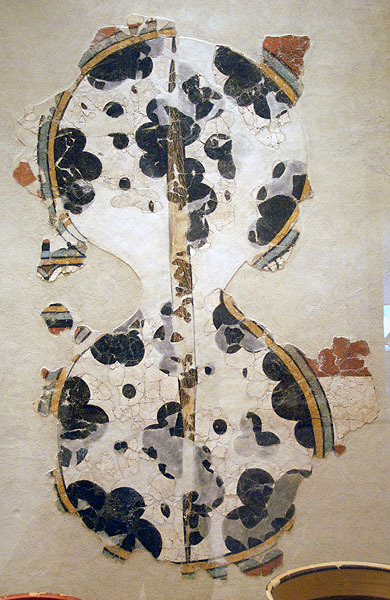 Small fragment of a wall painting excavated by Schliemann from the group of buildings on the South Wall at Mycenae. This scene was originallydescribed as "three figures with asses' heads." Another interpretation is that it represents three lion-headed figures (demons) shouldering a pole from which a prey hangs. 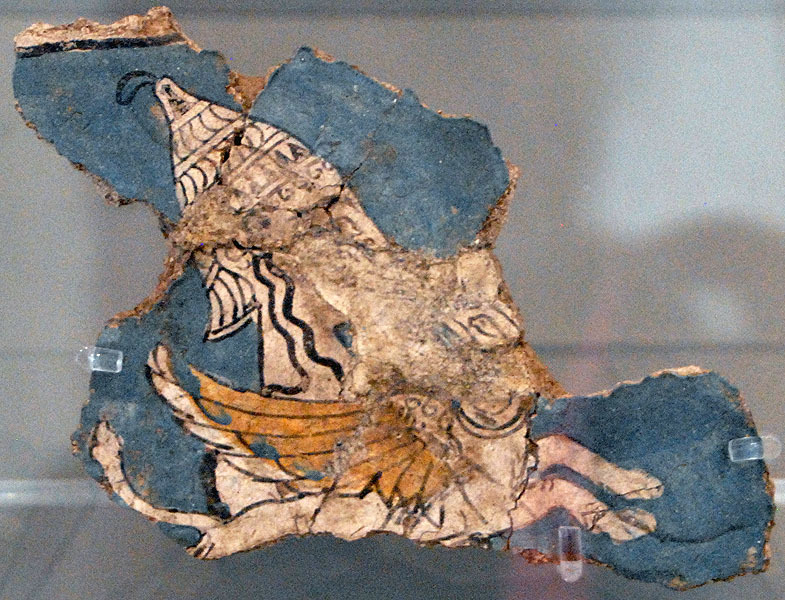 Small fragment of a wall painting exavated at Mycenae that appears to show the bust of a helmeted Mycenaean warrior and a griffin. 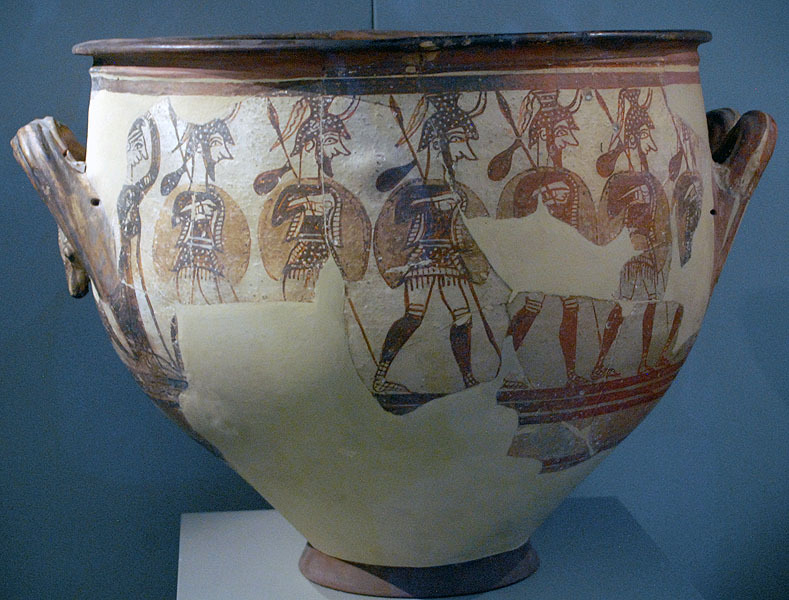 Large krater for mixing wine (commonly called the "Warrior Vase") with painting of warriors found by Schliemann in a house south of Grave Circle A at Mycenae. 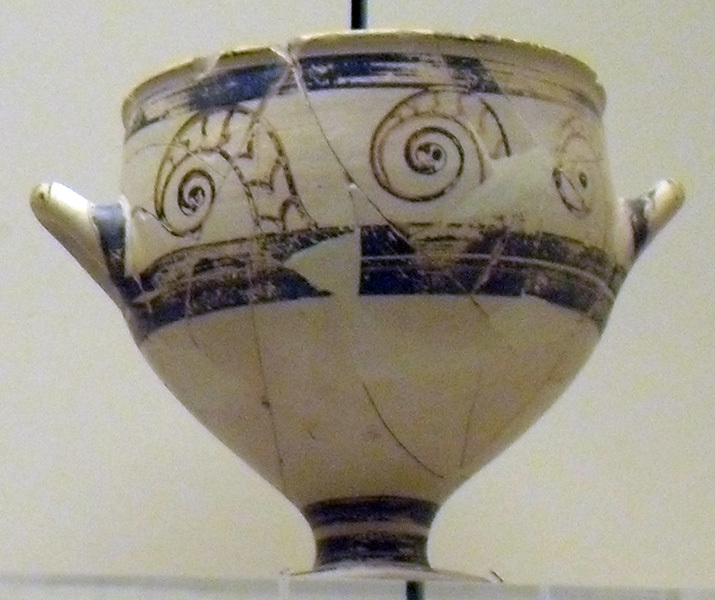 Dated to the 13th century BC. 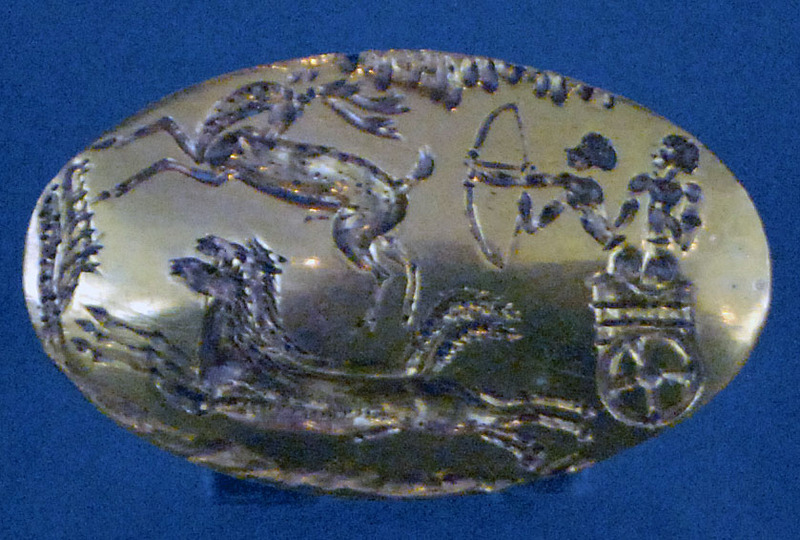 Handle of the large krater. 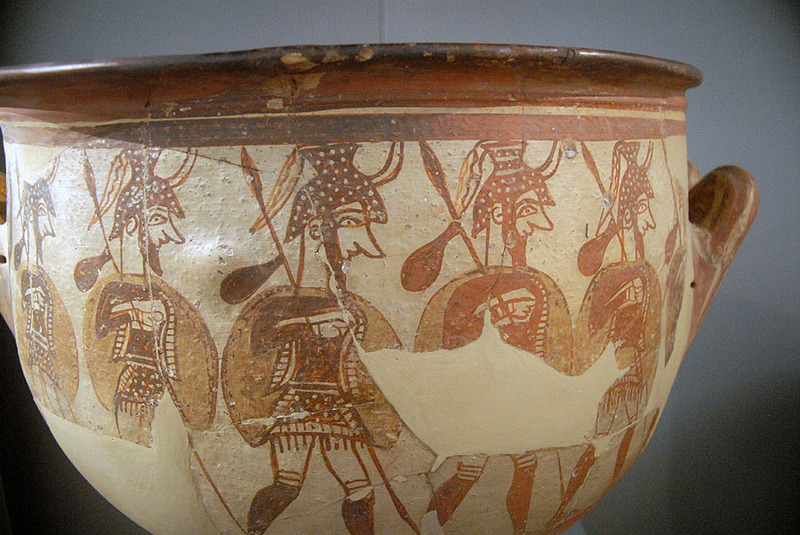 Closeup of warriors on the large krater. 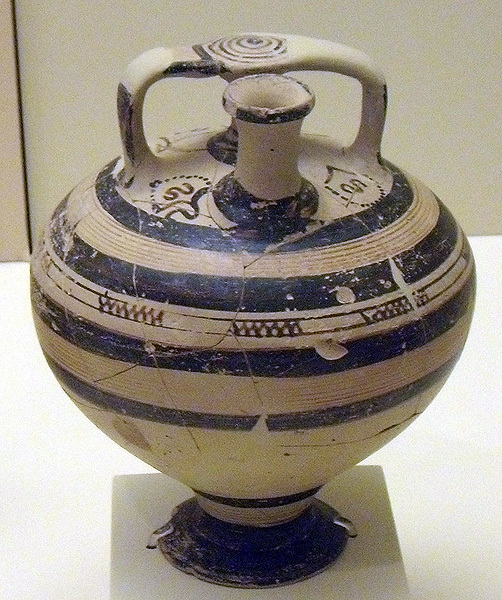 Canaanite style amphora found in the South House Annex storeroom at Mycenae; excavation number 54-601. 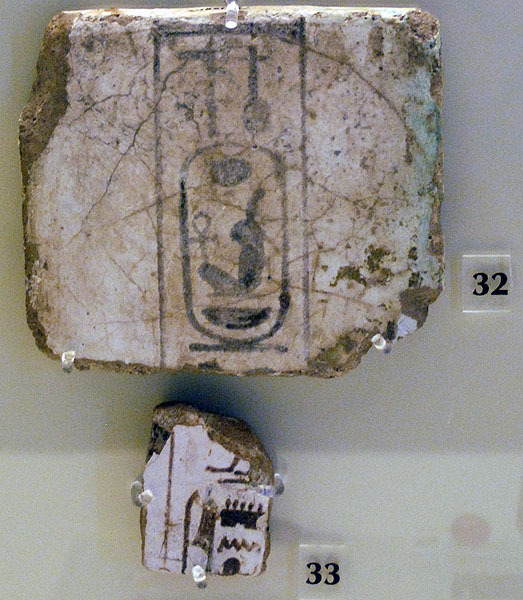 White faience plaque with cartouches prenomen of Amenhotep III (1386 to 1349 BC) during the 18th Dynasty in Egypt. Found in the Cult Center Room 31 (the room with the wall paintings). The larger fragment was found in phase 7 of the room while the smaller fragment was found in phase 8 of the same room. 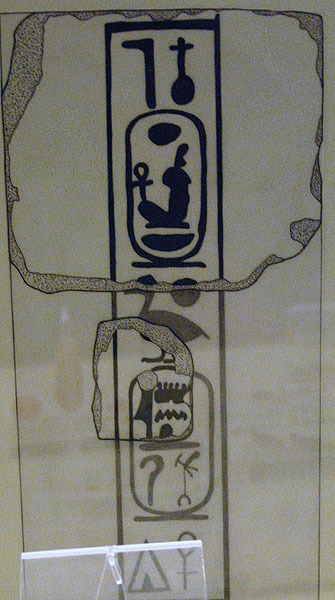 Drawing of the proper orientation of the two Egyptian plaque fragments. 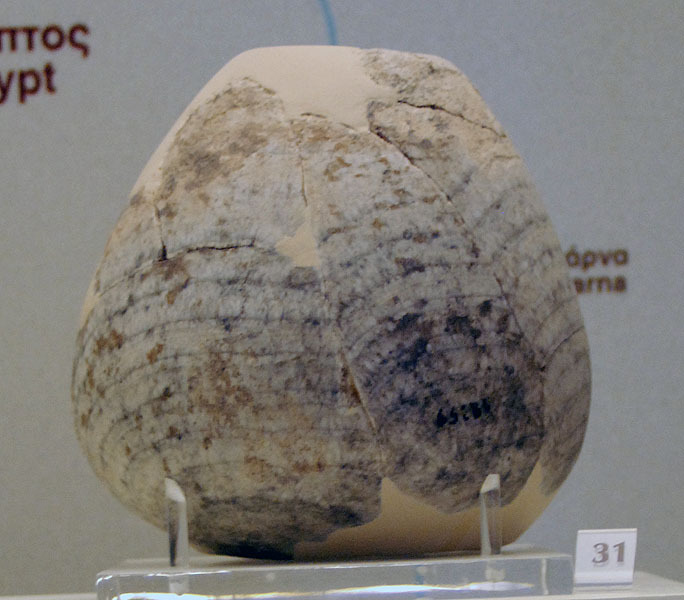 Egyptian ("baggy style" - 18th DYN) alabastron found in the House of Shields at Mycenae. 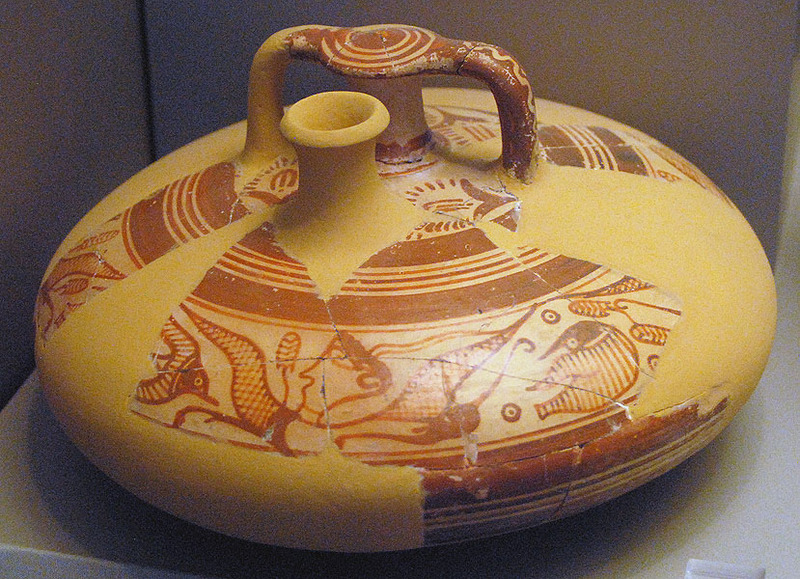 Pottery vessel with pouring spout found at Mycenae. 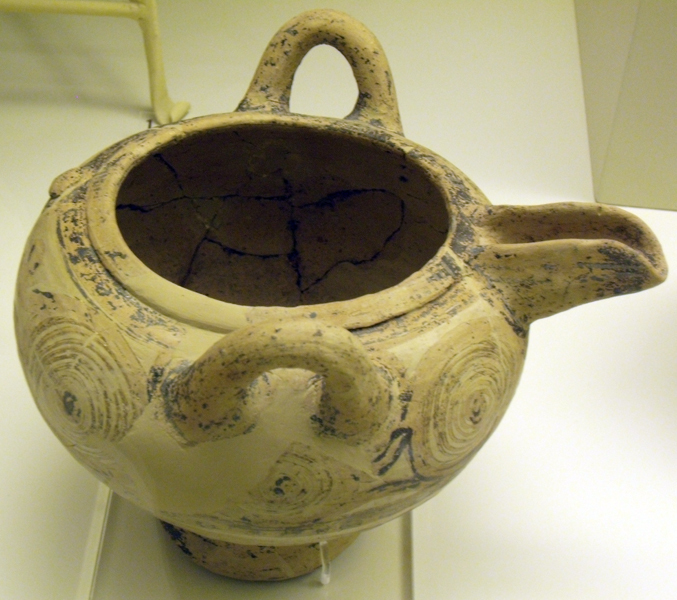 Pottery vessel with pouring spout found at Mycene. 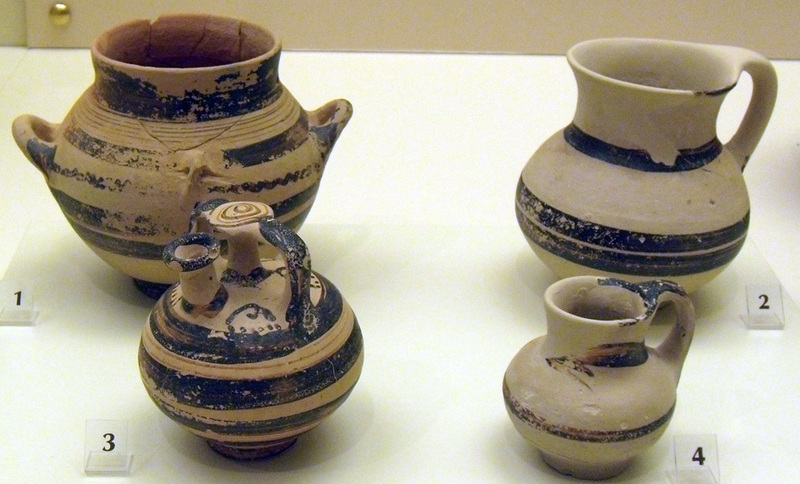 Four pottery vessels from Mycenae. 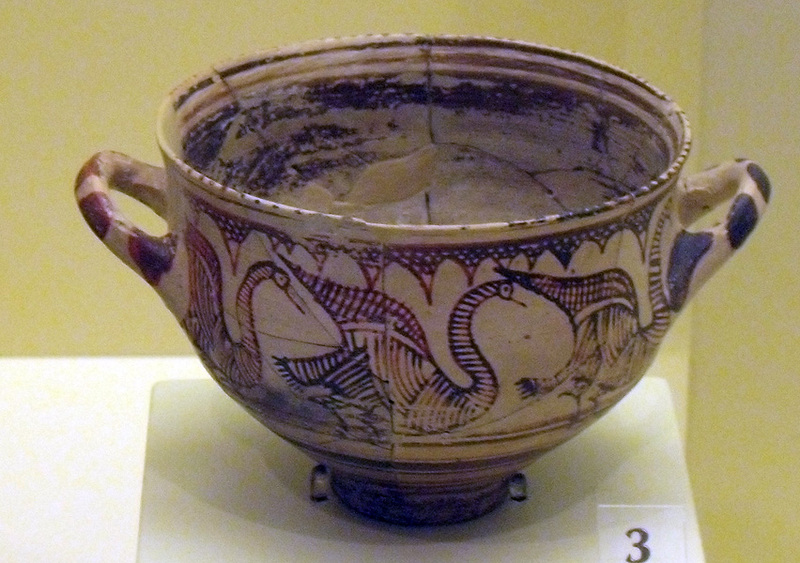 Painted krater with the design of swans from Mycenae. 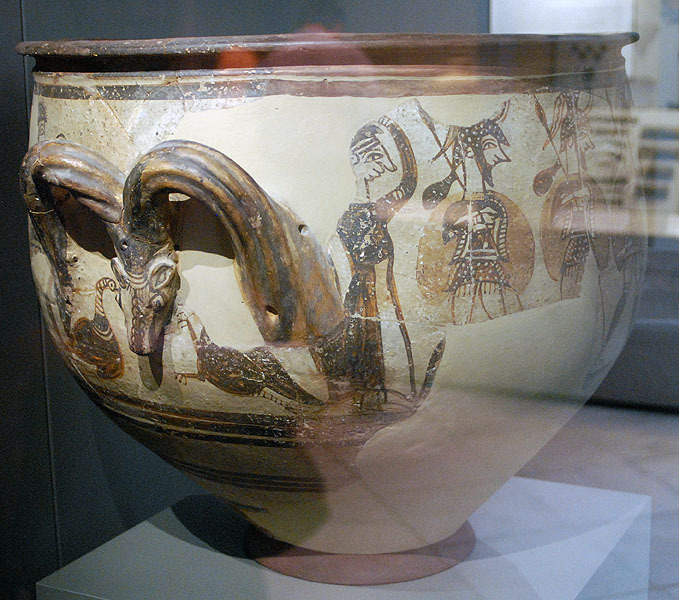 Painted krater with scene of a chariot from Mycenae. 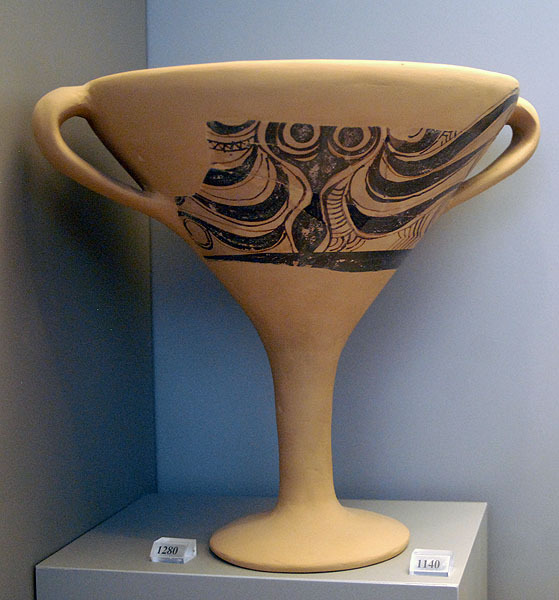 Kylix with octopus painted decoration from Mycenae. Stirrup jar with painted decoration; museum inventory 10535. 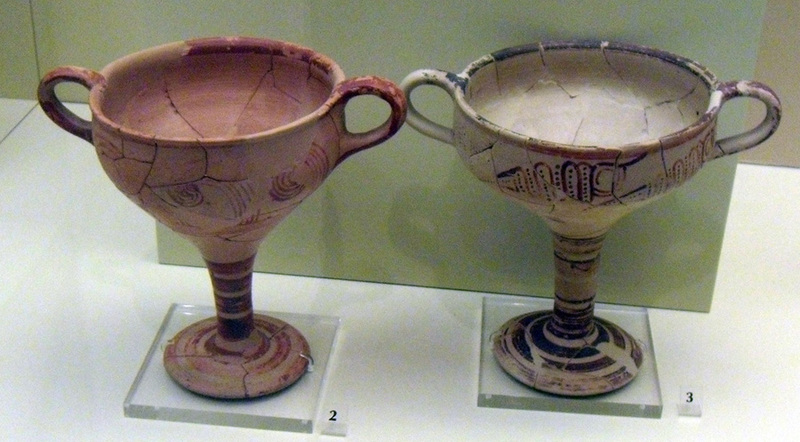 Two stemmed cups from Mycenae. 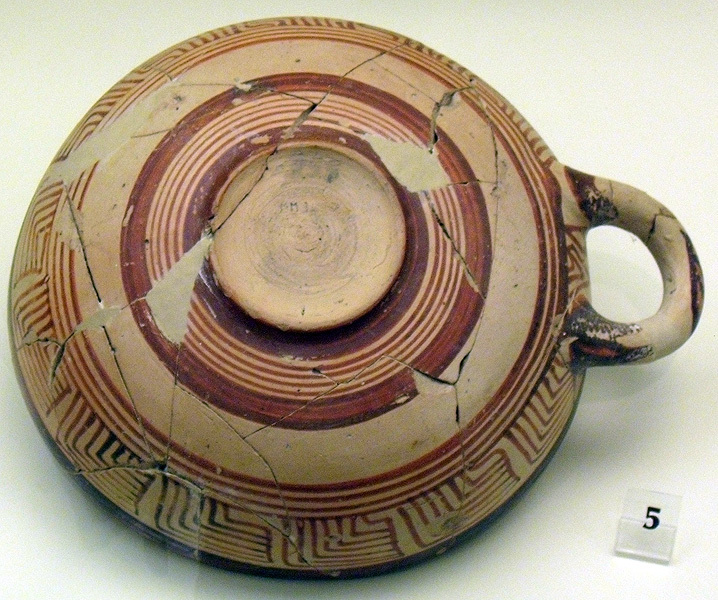 One handled wine cup from Mycenae. 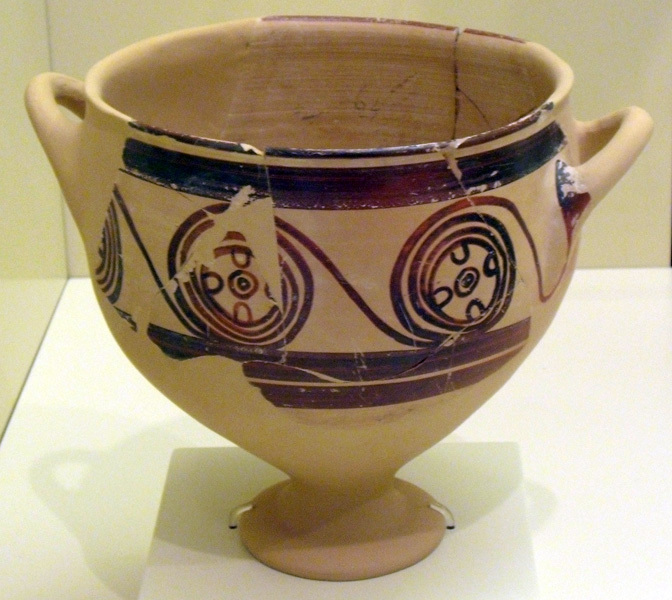 Spouted bowl with two handles from Mycenae. 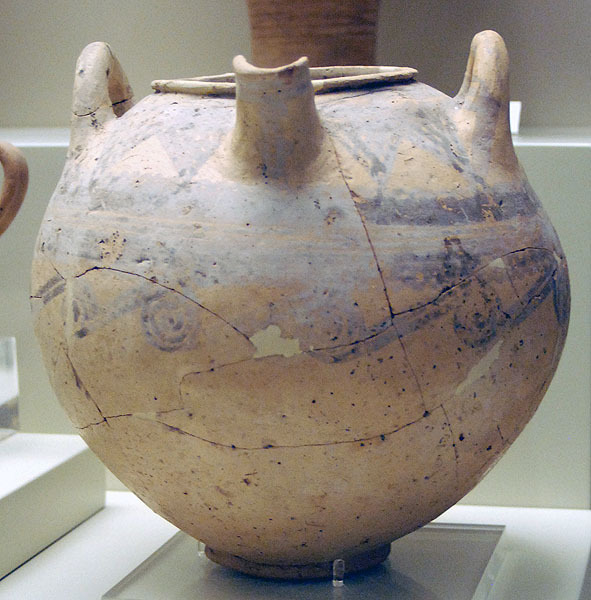 Mycenaean stirrup handle jug from Mycenae. 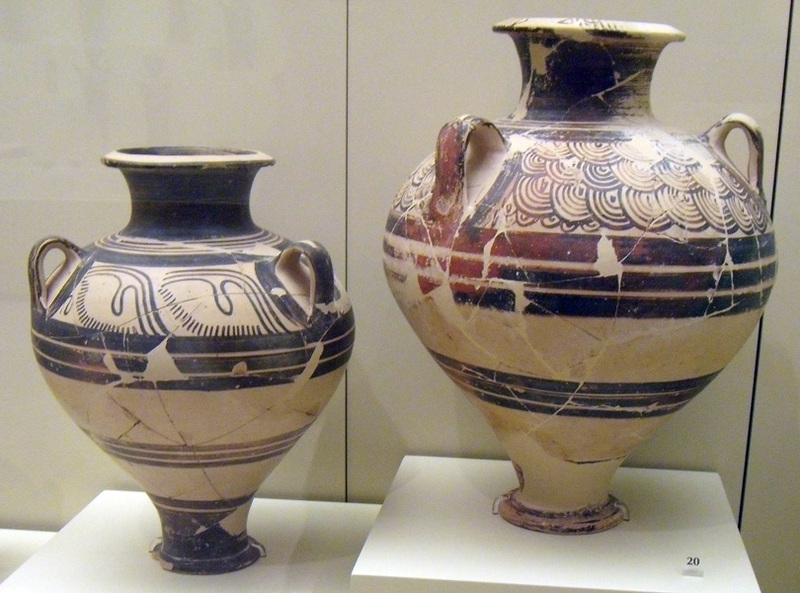 Two examples of three handled Mycenaean Palace Style amphora from Mycenae. 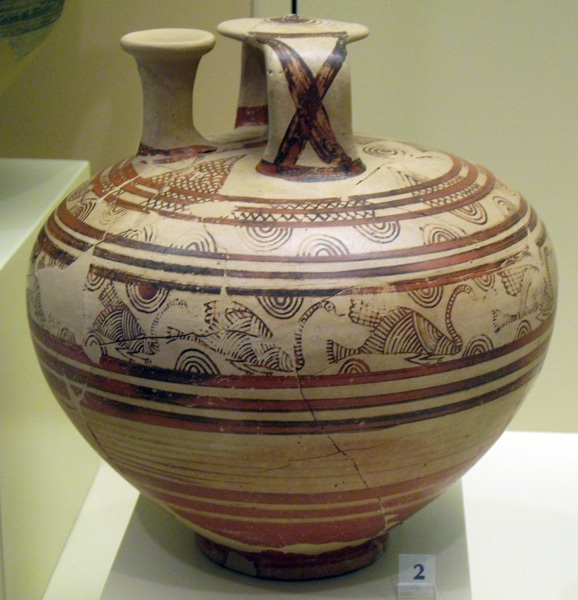 Three handled Mycenaean Palace style amphora from Mycenae. 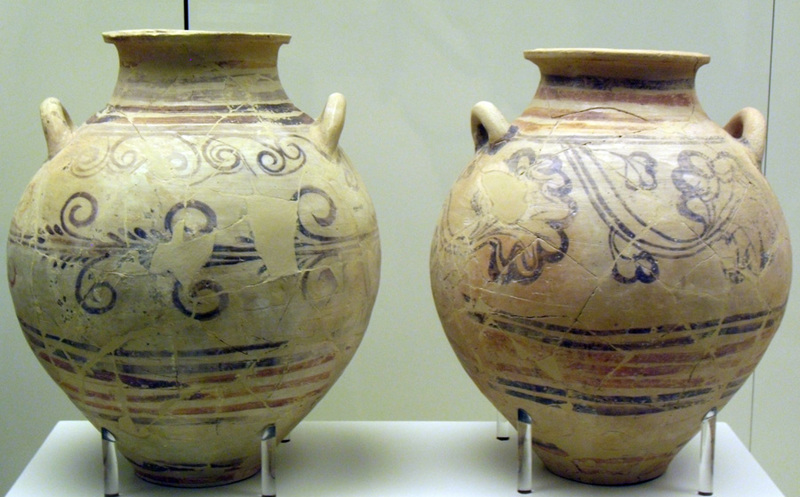 Two handled amphora from Mycenae. 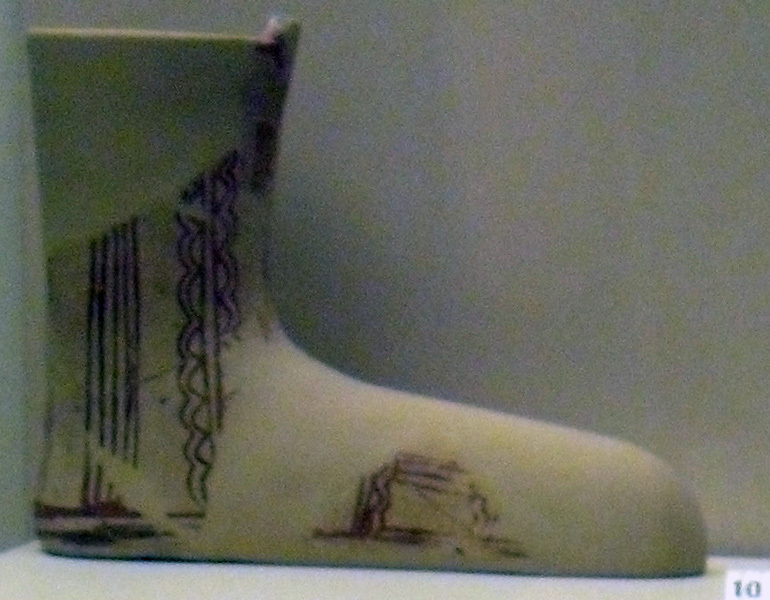 Boot effigy pottery vessel from Mycenae. 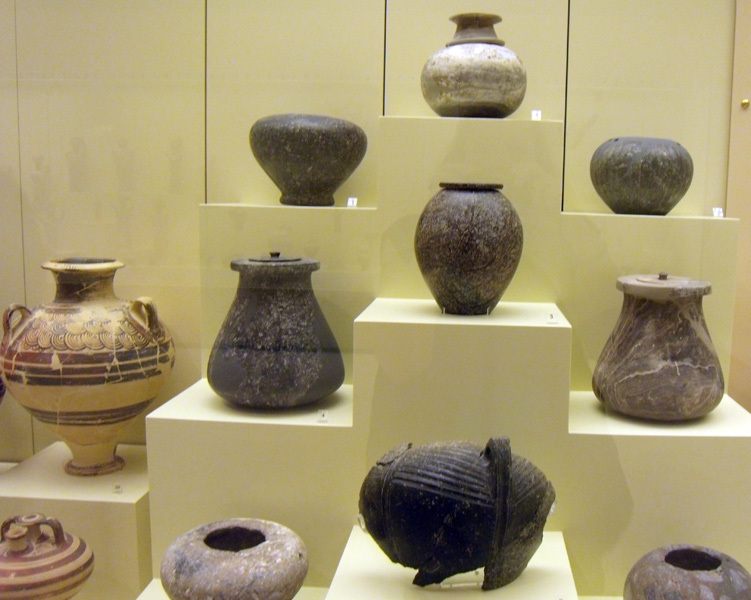 Carbonized seeds (cereal on the right side) from Mycenae. 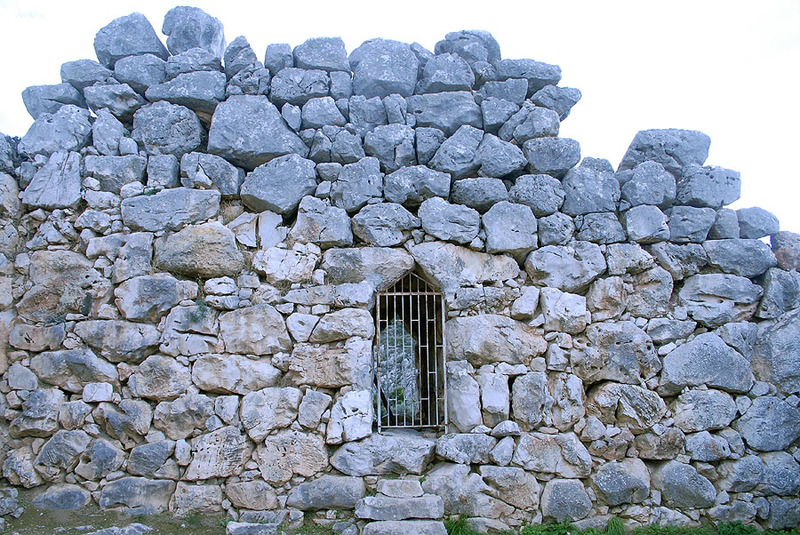 Tholos tombs were built in Late Helladic III (ca. 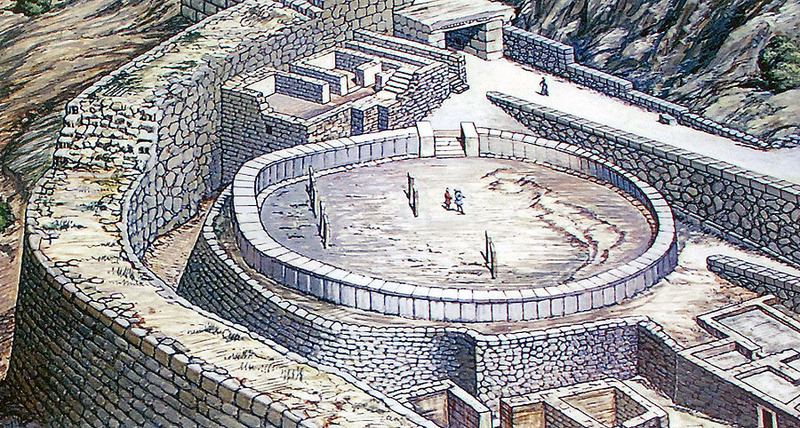 1400 - 1200 BC) at Mycenae. 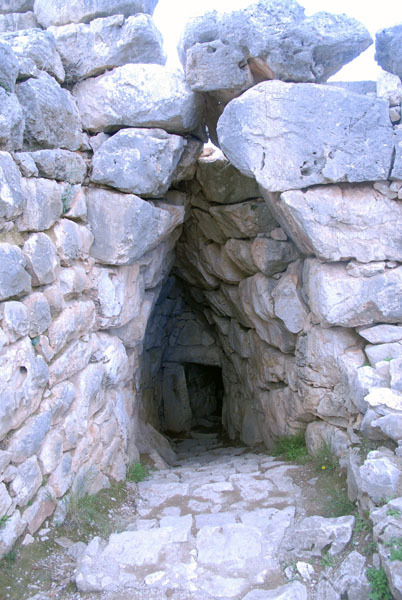 Steps leading down to the cistern in the citadel of Mycenae.